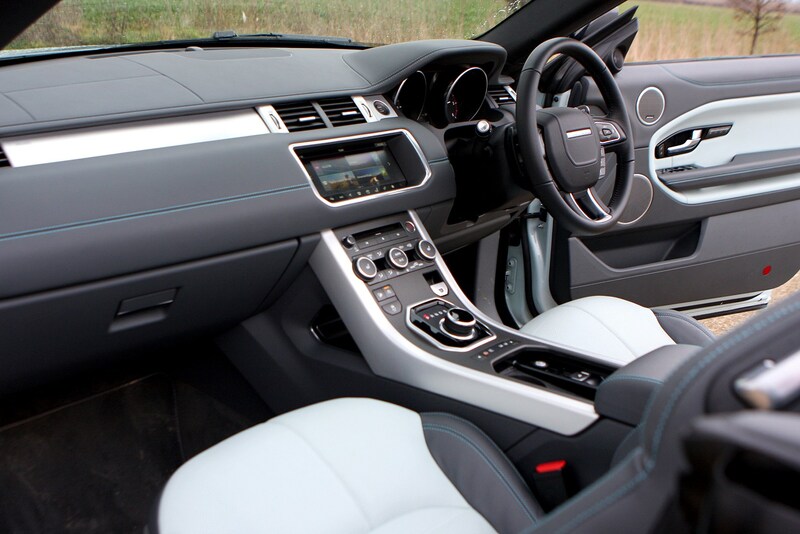 Insurance group: 39 - 45 How much is it to insure? 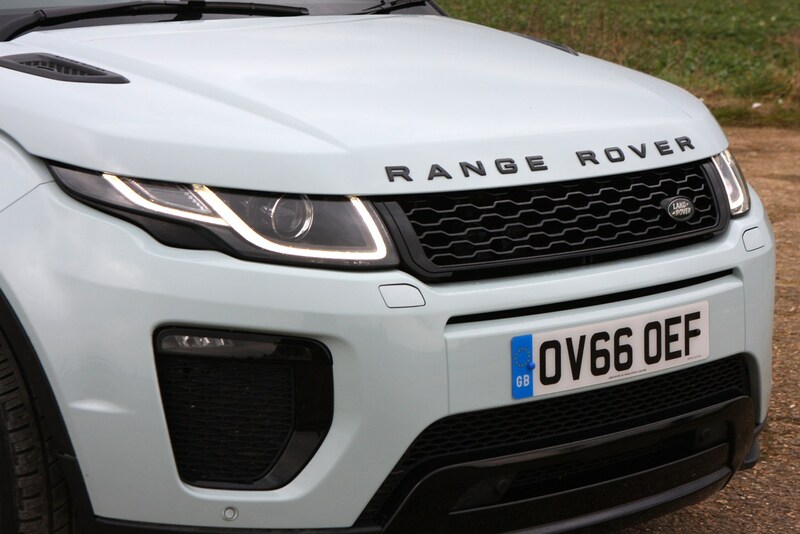 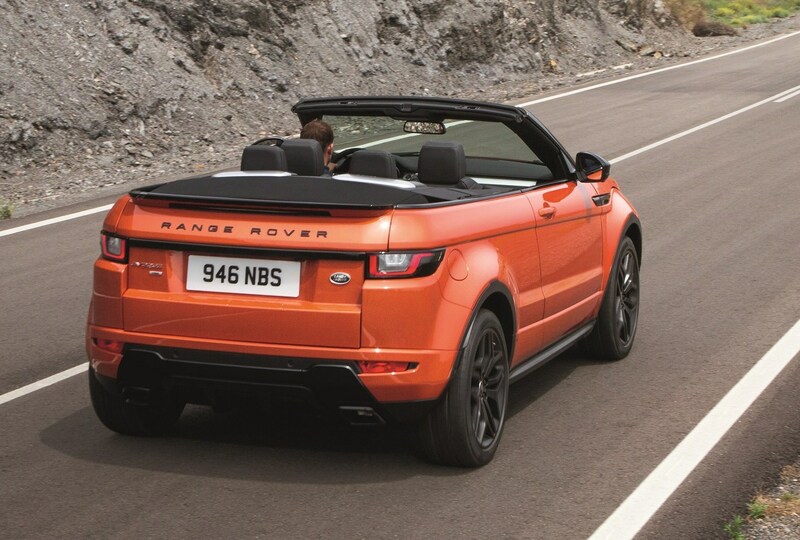 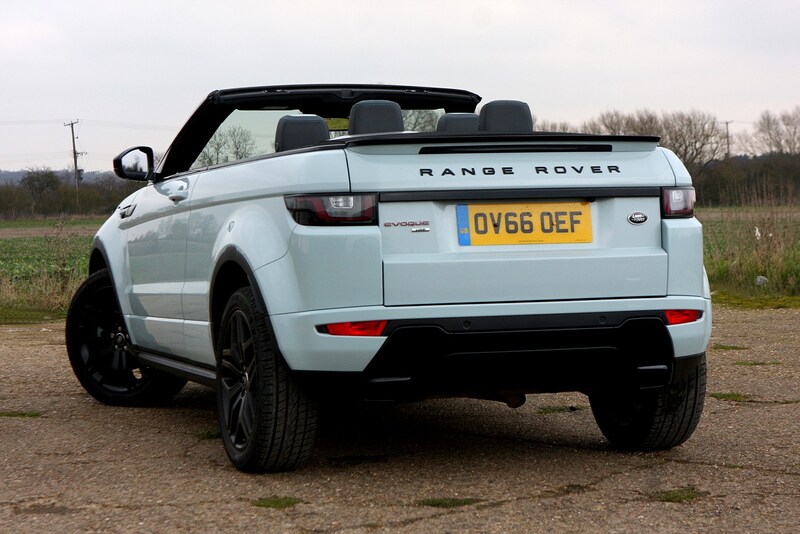 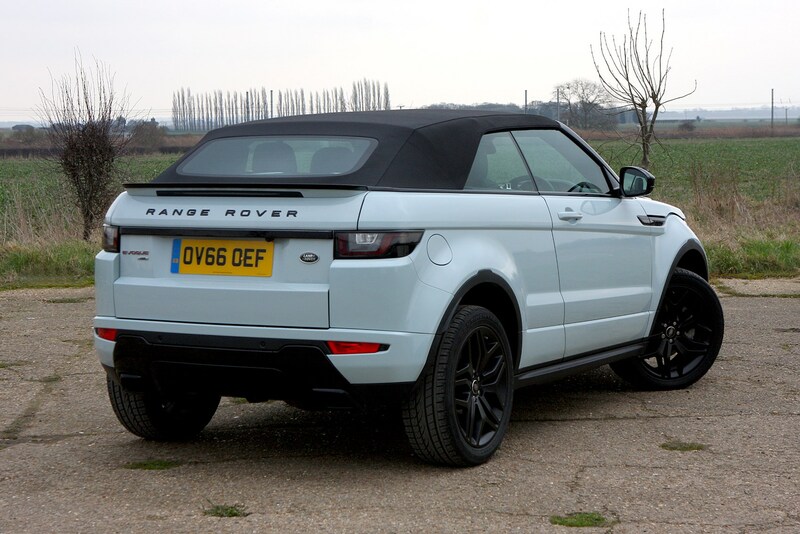 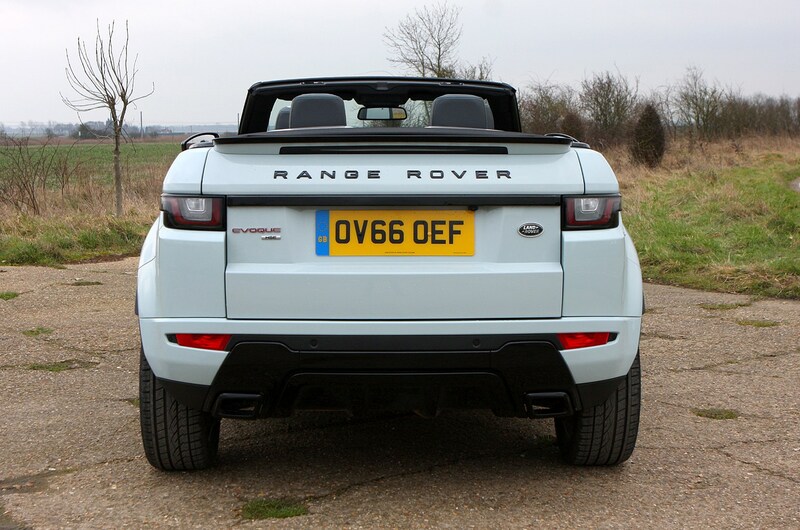 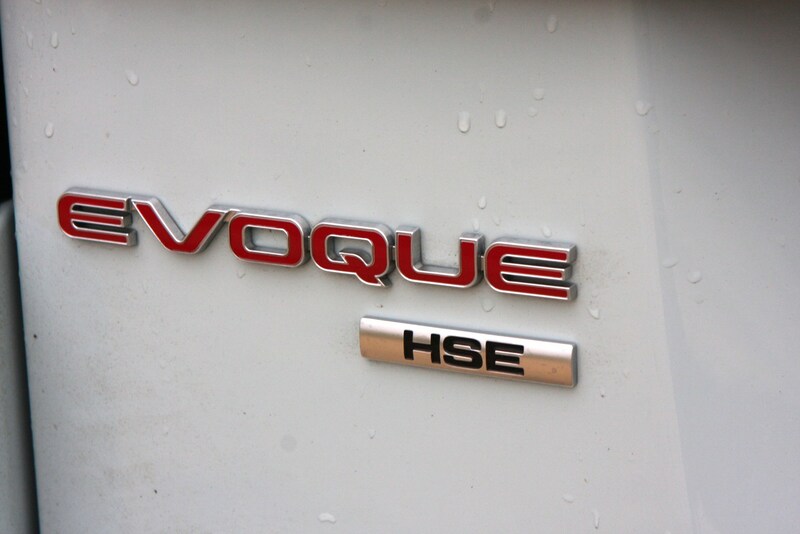 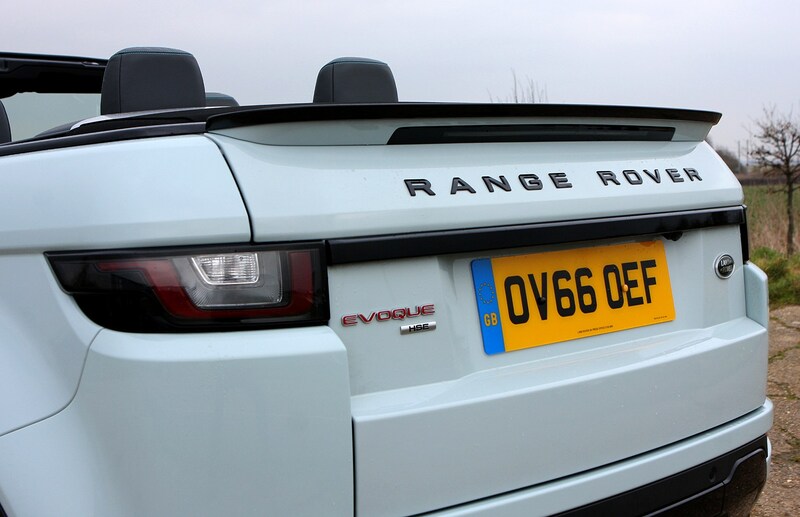 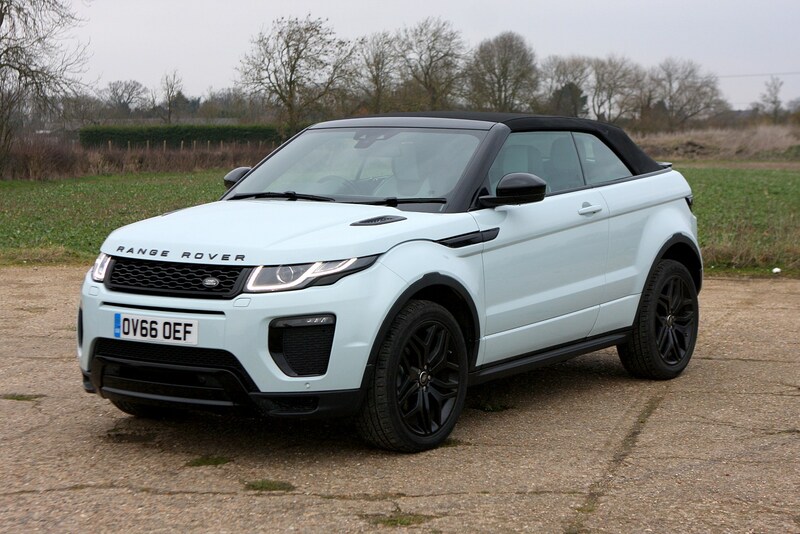 More than four years after sales of its more conventional siblings began, a third bodystyle was added in the form of the Land Rover Range Rover Evoque Convertible. 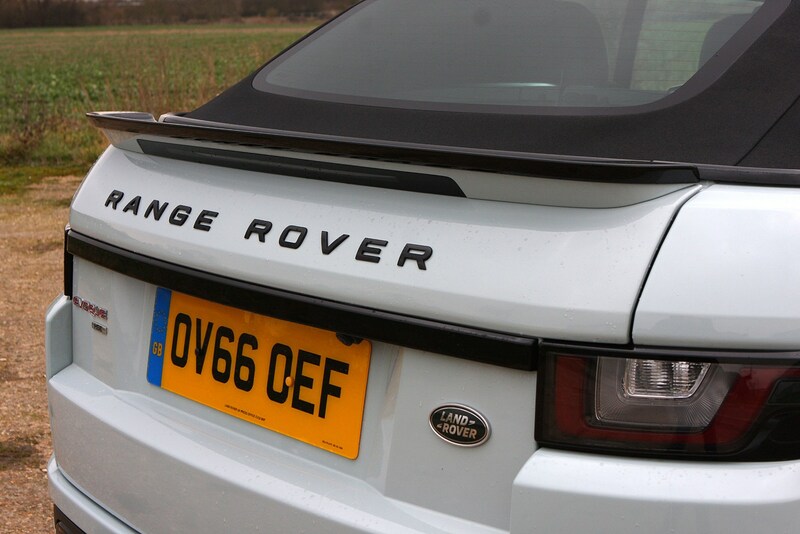 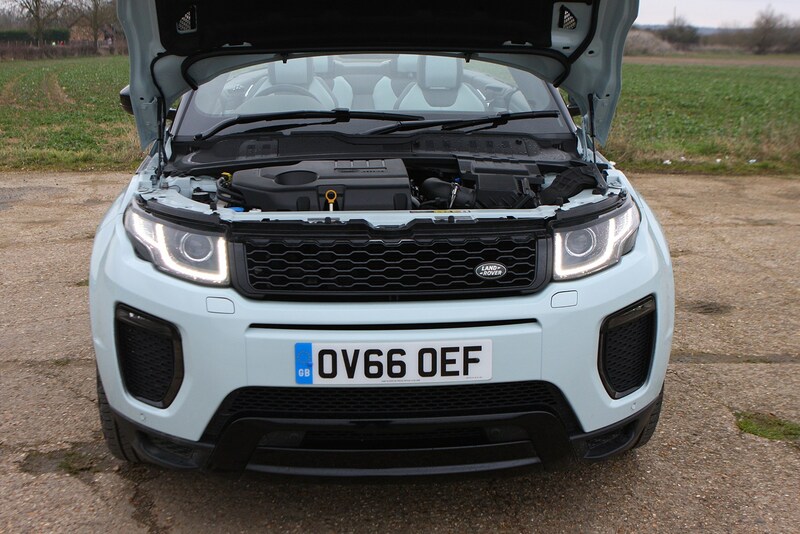 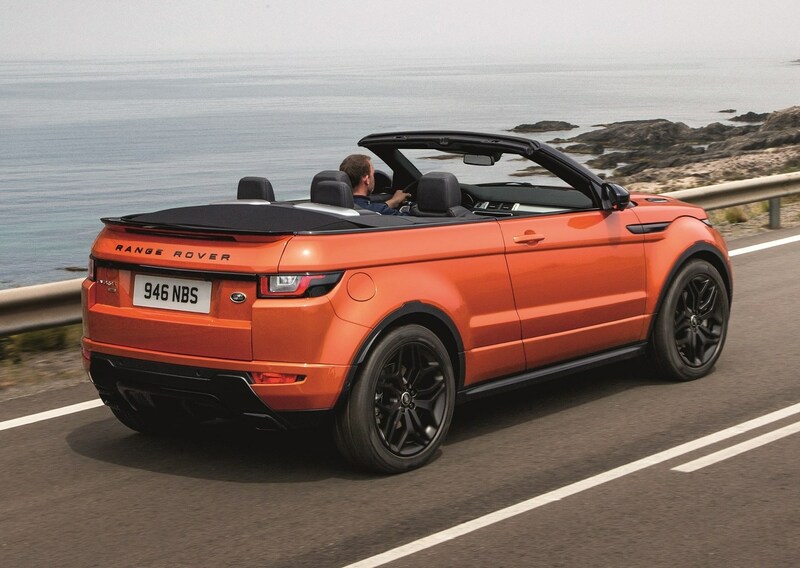 This isn’t simply the existing three-door Range Rover Evoque Coupe with its roof lopped off. 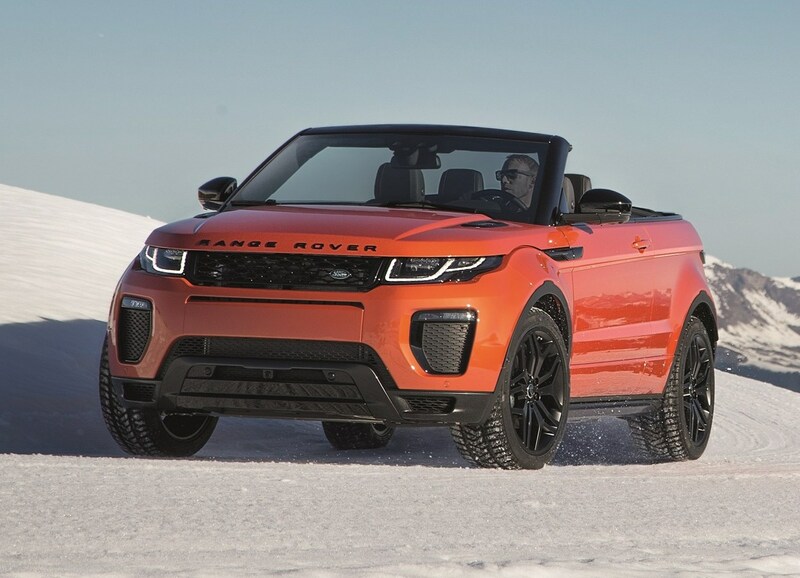 Significant re-engineering has been undertaken to ensure both the integrity of its open-top design, as well as to preserve its off-roading capability. 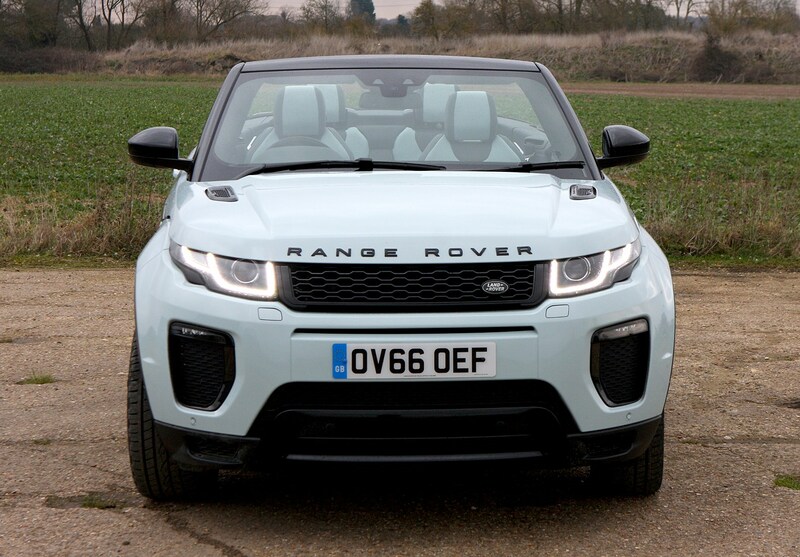 As a premium convertible SUV it has no direct rivals – yet. 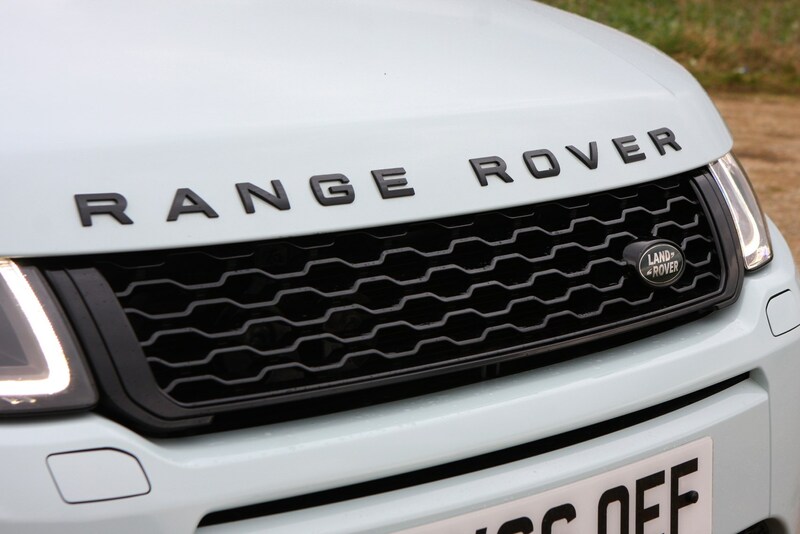 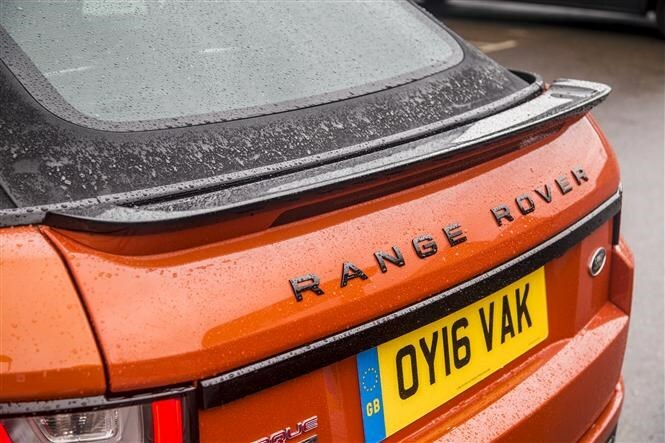 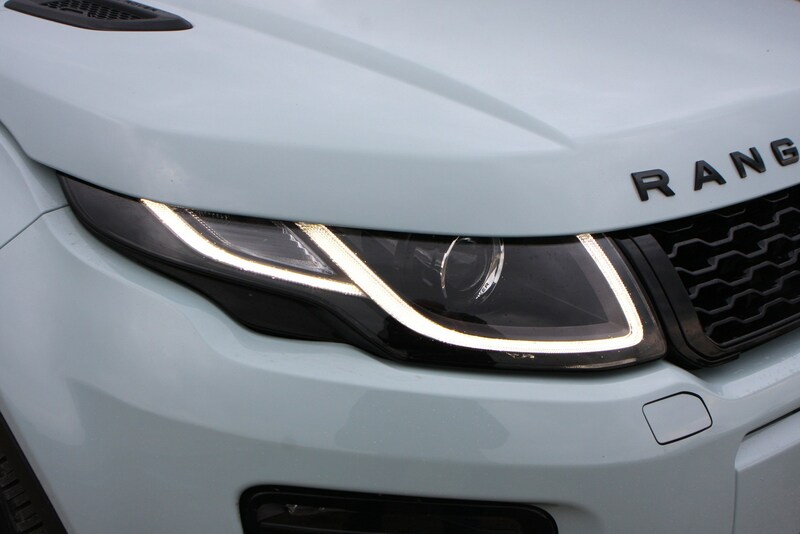 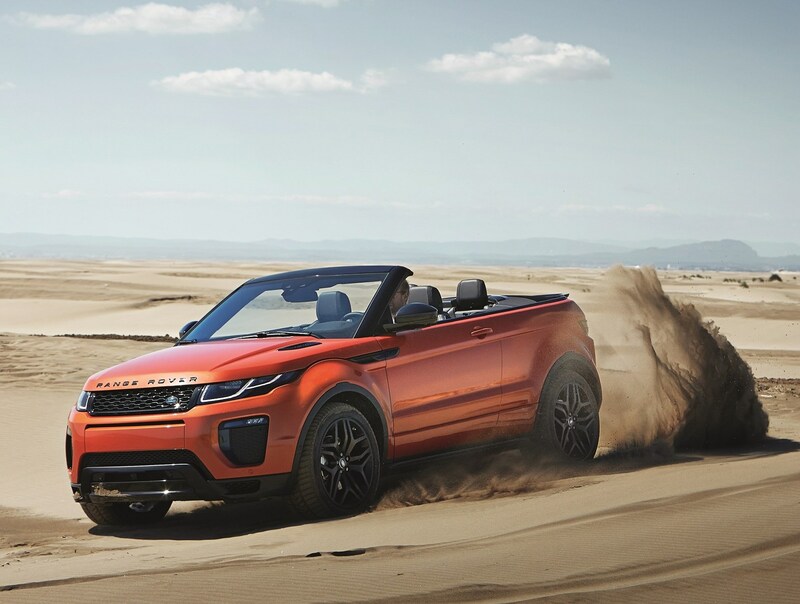 Land Rover expects around 20% of sales will be existing Evoque owners wanting a replacement model that offers something different, and cites the Audi A5 Cabriolet, BMW 4 Series Convertible and Mercedes-Benz C-Class Cabriolet as its primary rivals. 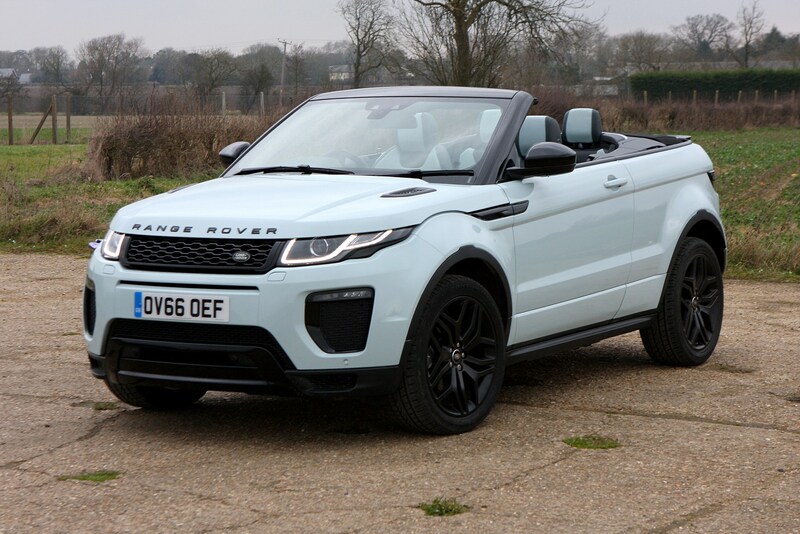 To bolster its rigidity for on- and off-road driving, the Range Rover Evoque Convertible’s underpinnings have been significantly strengthened, which in turn adds almost 280kg to its heft compared with the Coupe version. 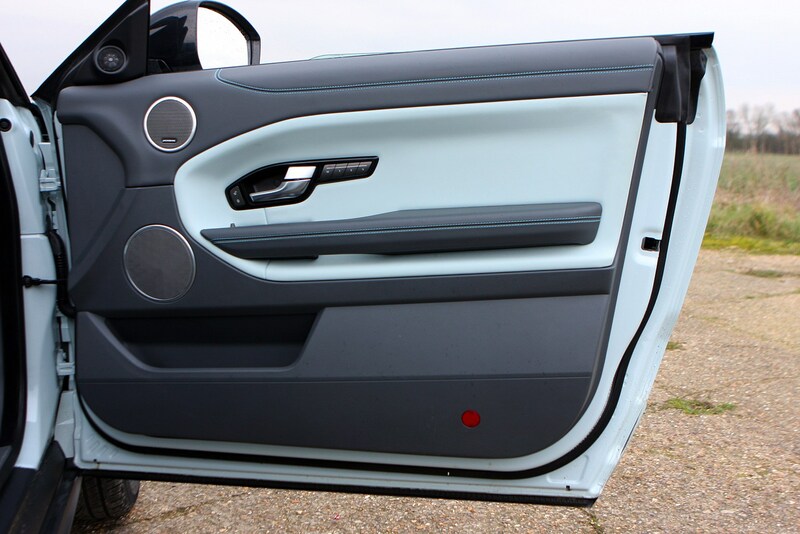 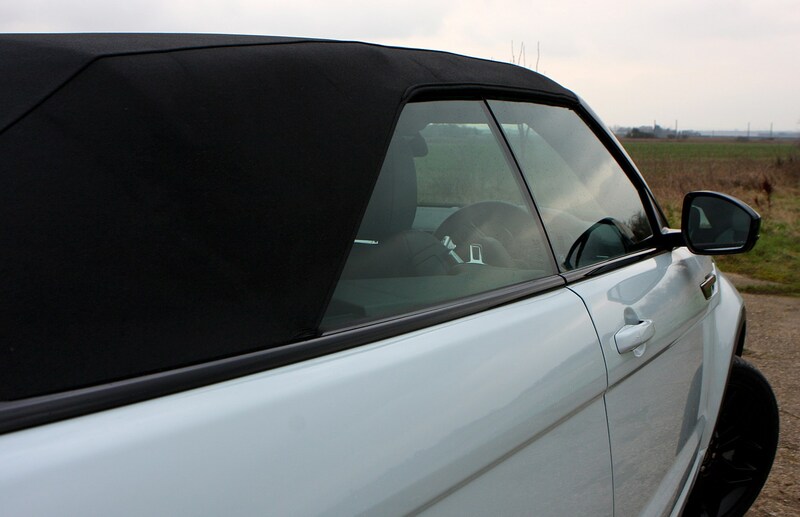 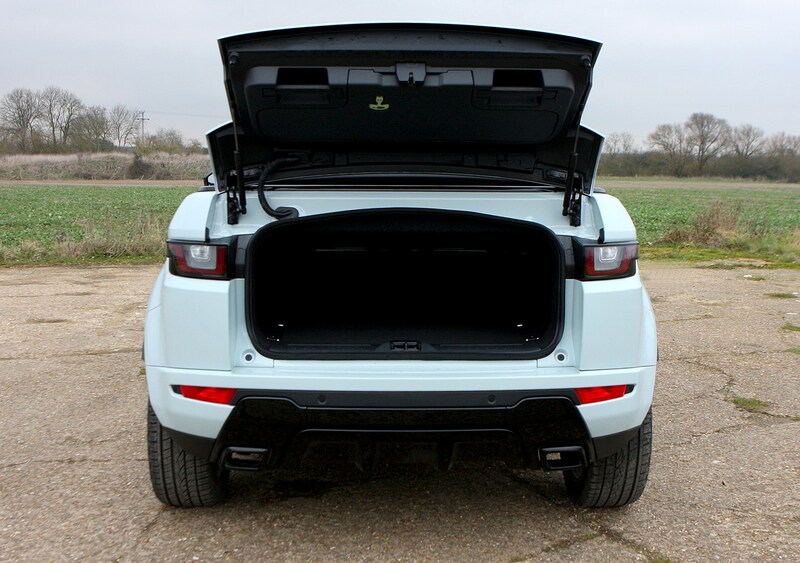 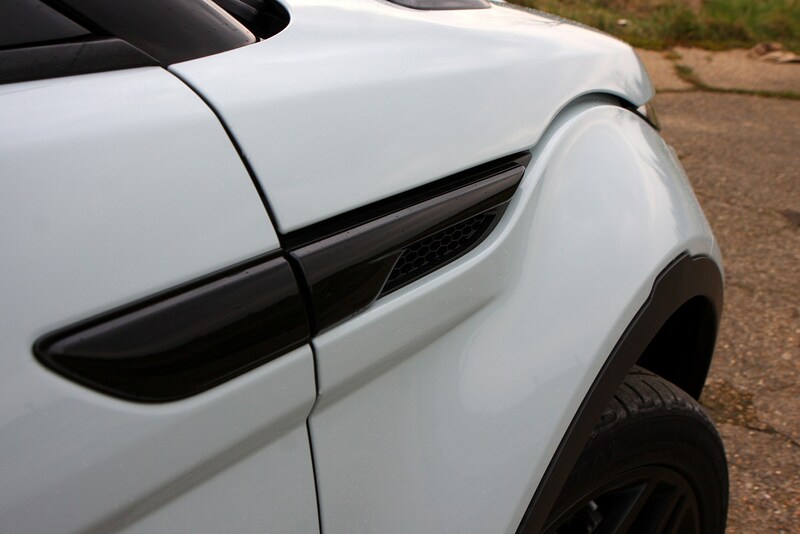 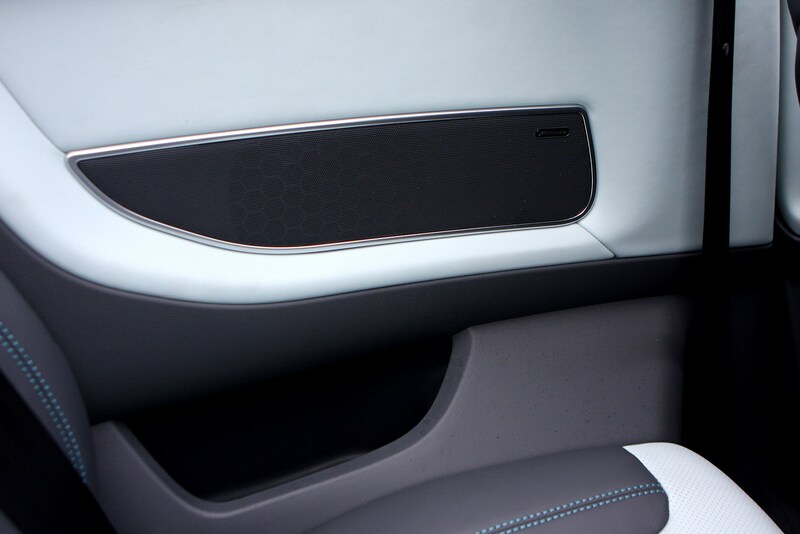 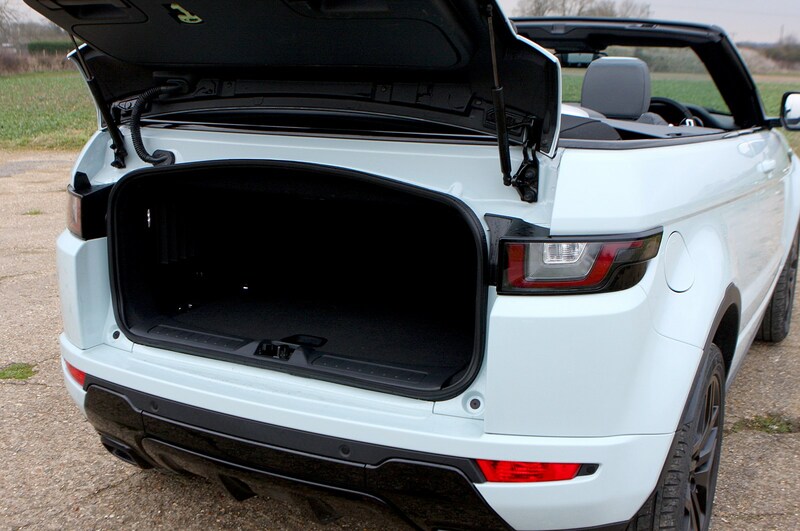 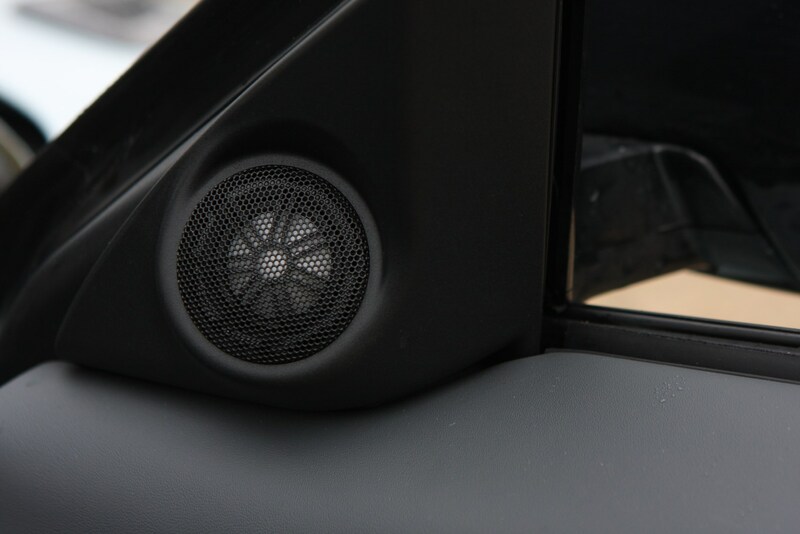 In addition to supplementary bracing in the floor and windscreen surround, the soft-top Evoque’s stronger doors are unique, too. 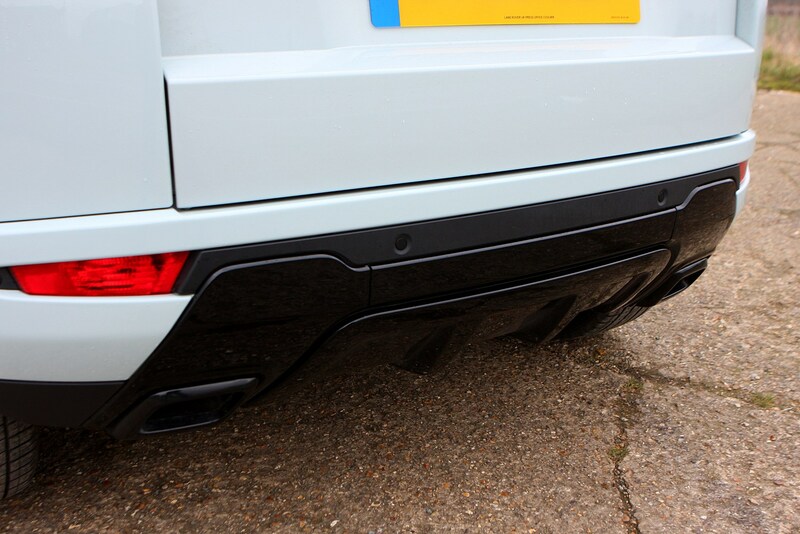 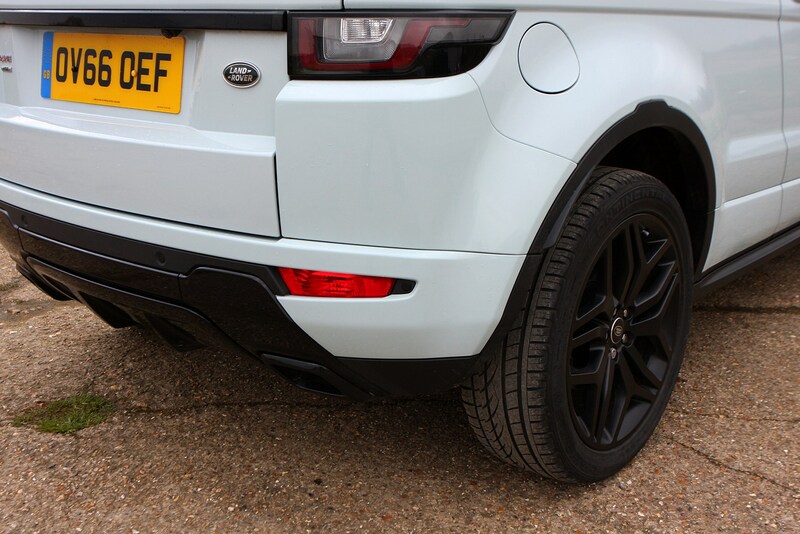 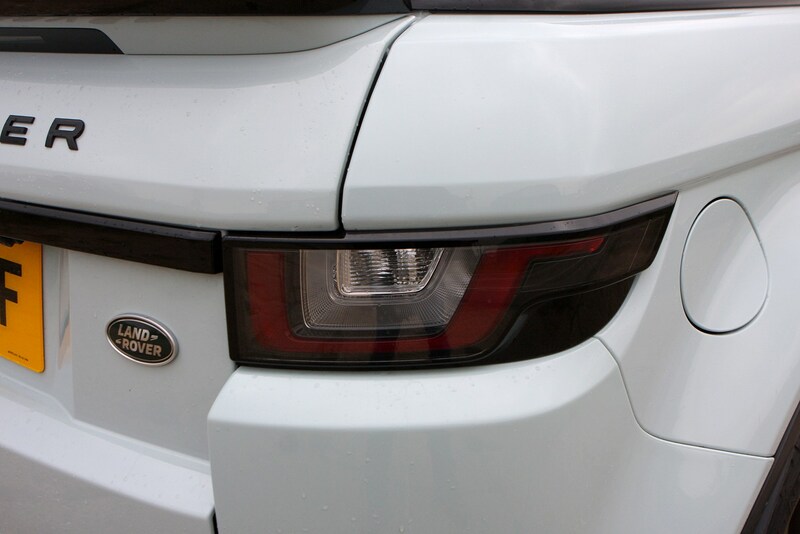 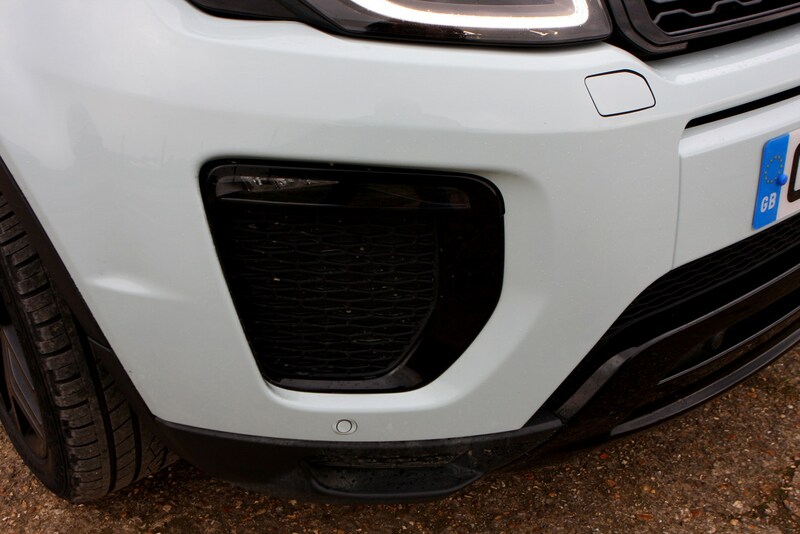 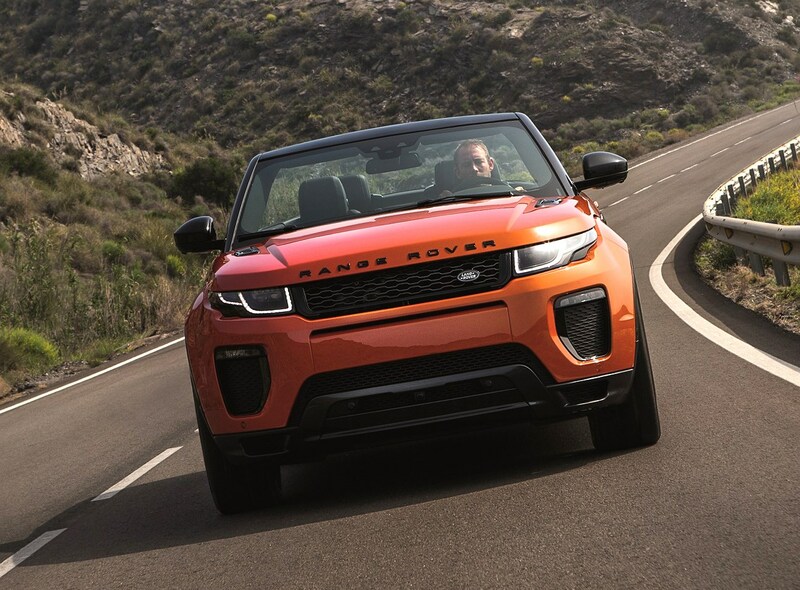 Plus, there’s a Roll-Over Protection Device (RPD) which deploys two aluminium hoops behind the rear passengers’ heads within 90 milliseconds if sensors detect the Range Rover’s about to turn upside-down. 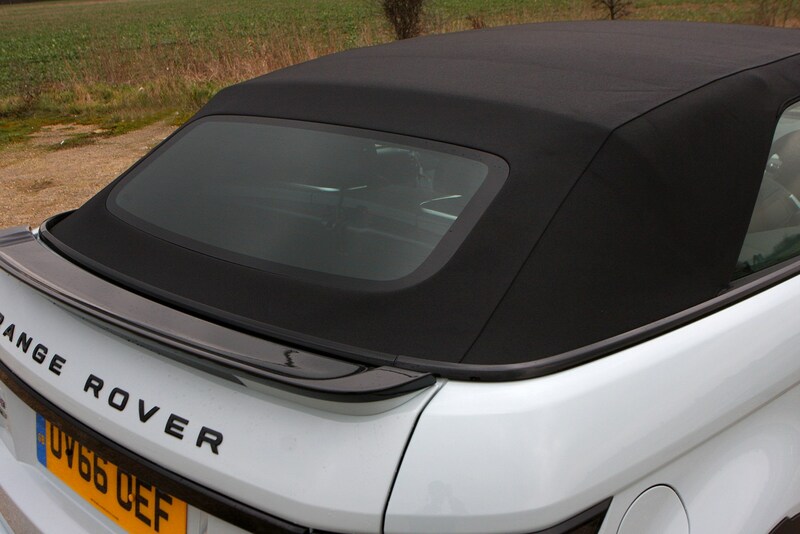 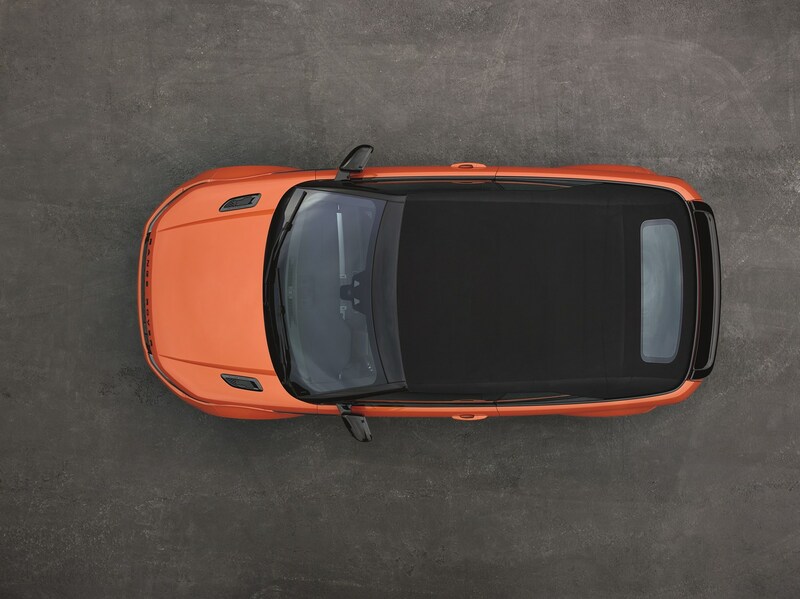 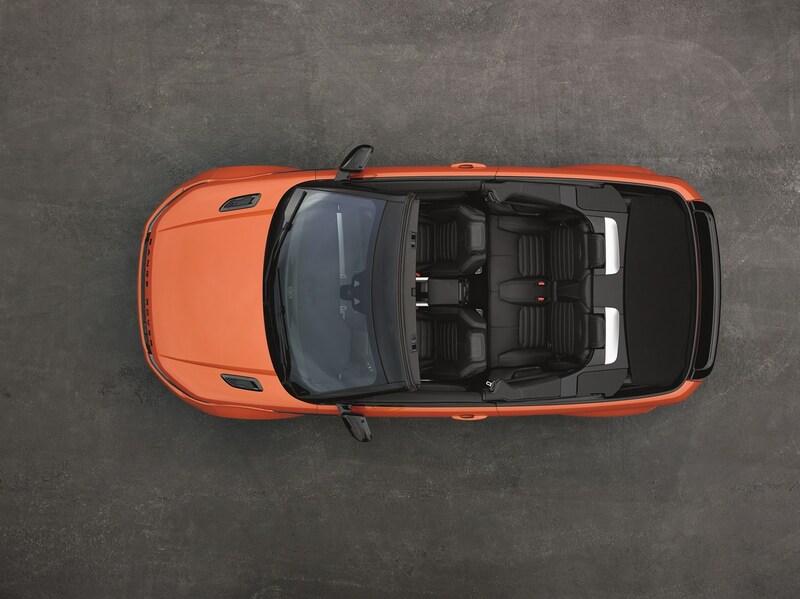 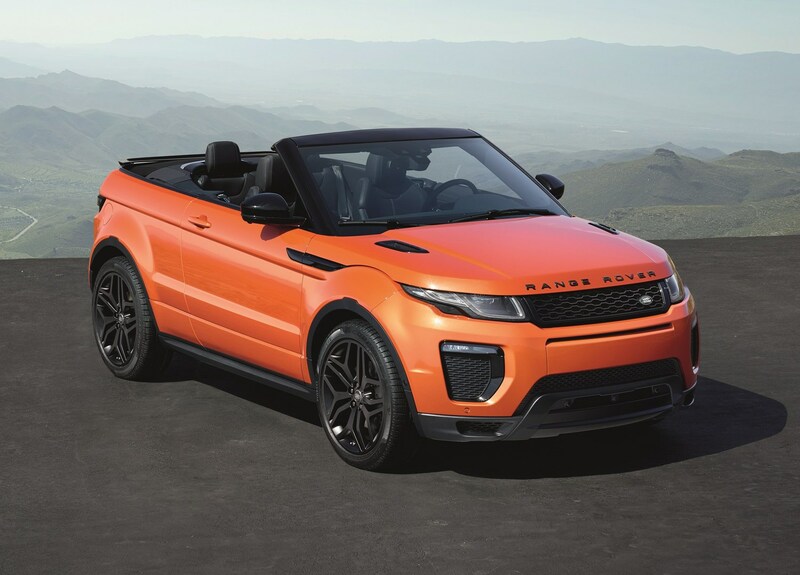 Featuring the largest fabric roof yet produced, the Range Rover Evoque Convertible’s top can be electrically lowered in 18 seconds and raised in 21 – all at speeds of up to 30mph. 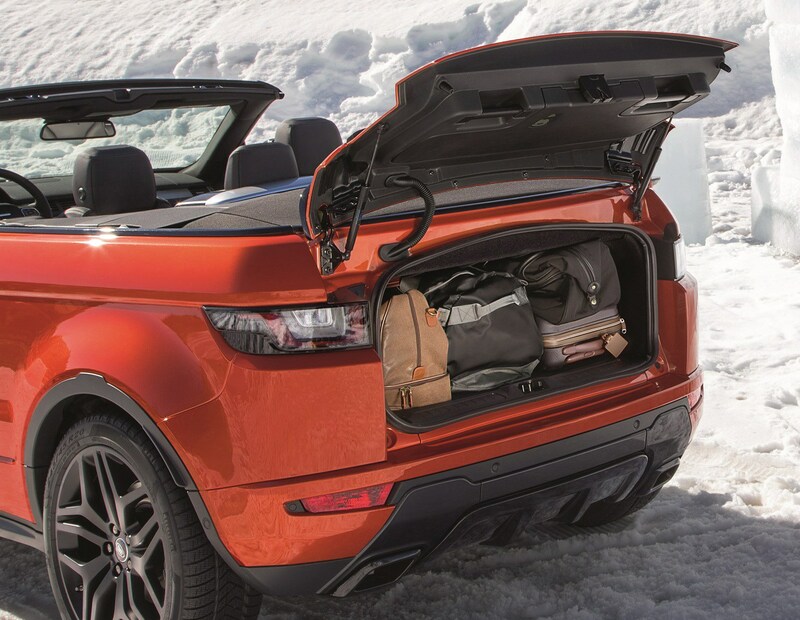 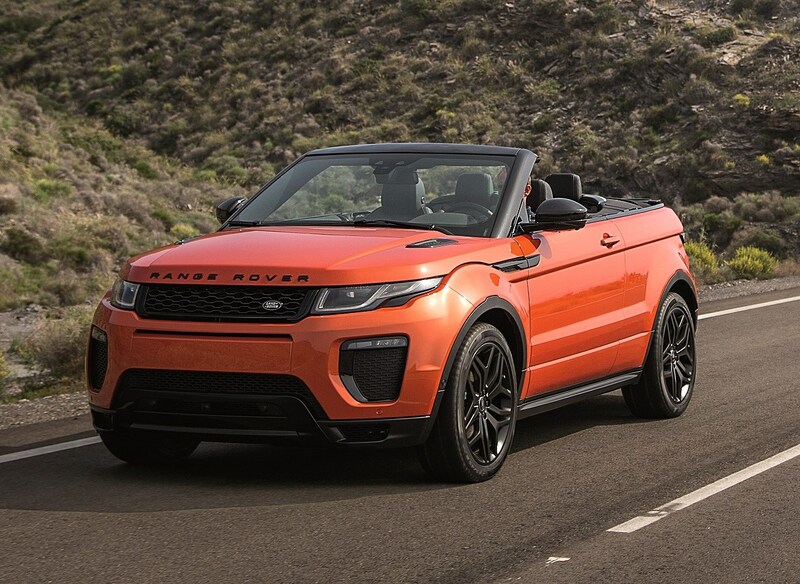 Practicality suffers with the Evoque’s transition into the realms of convertibledom – it’s a strict four-seater and at 251 litres the boot’s some 169 litres short of the Coupe’s. 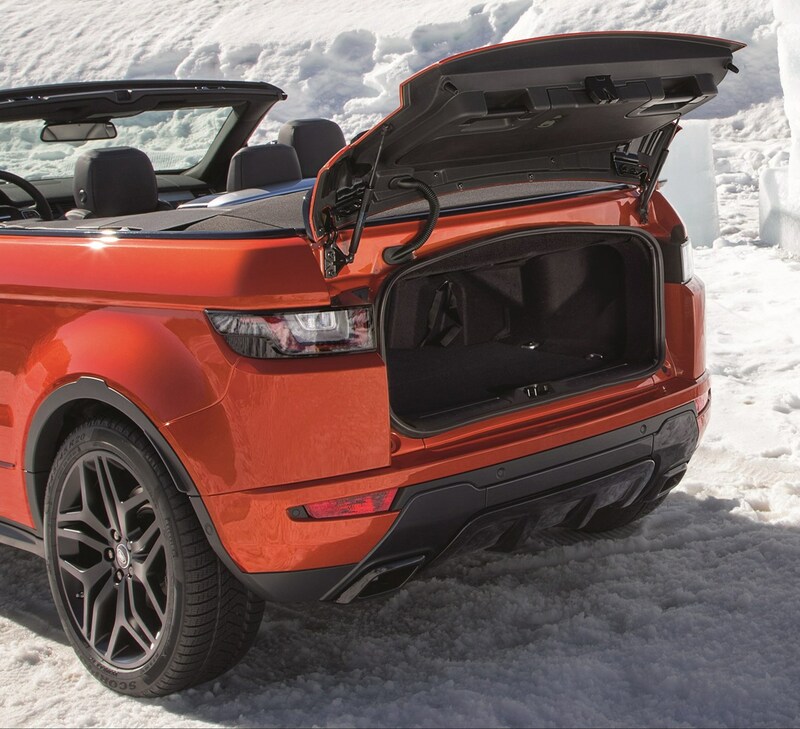 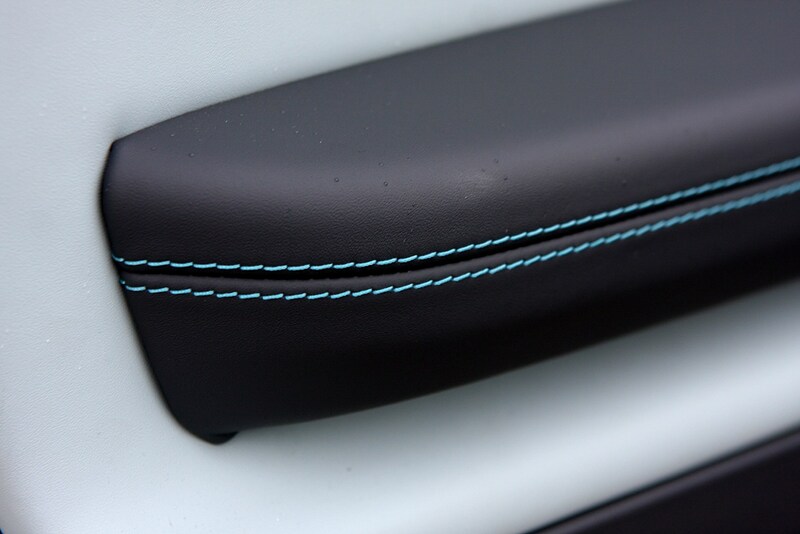 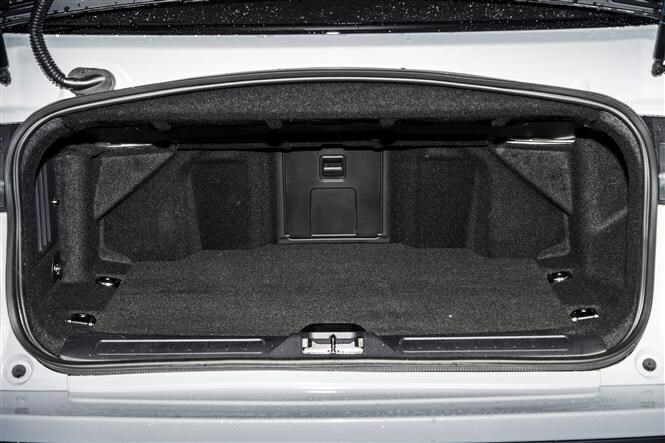 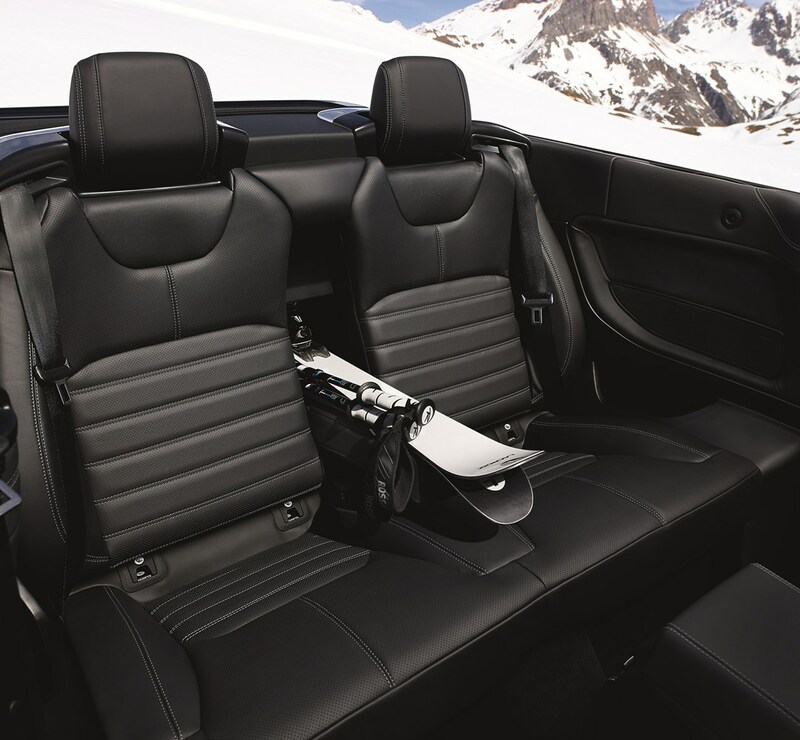 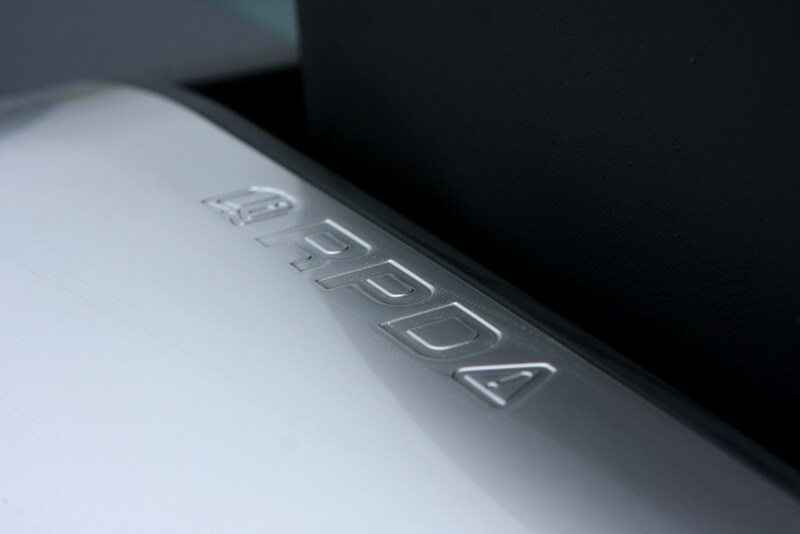 Its top-hinged bootlid makes access awkward but there is an optional ski-hatch for longer loads. 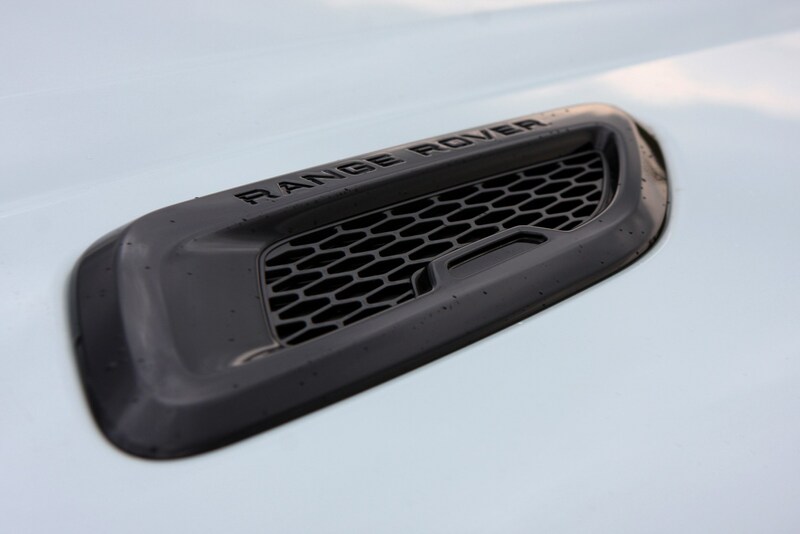 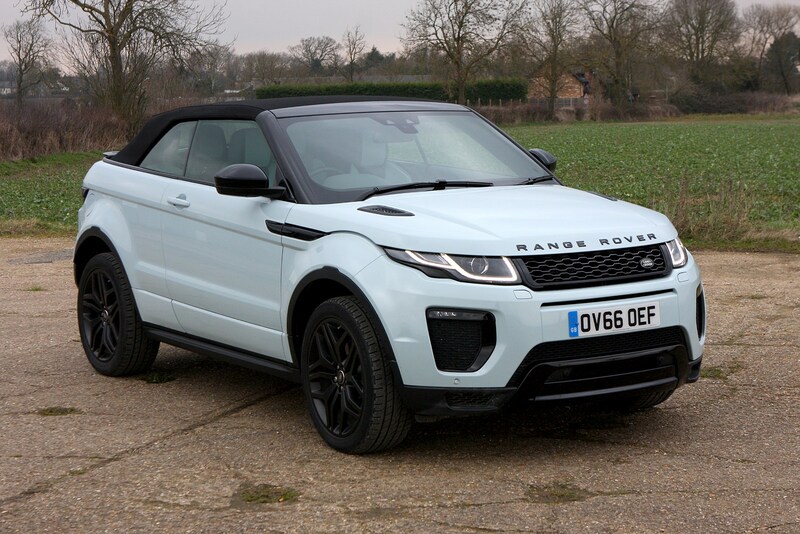 Sitting at the top of the range, the Land Rover Range Rover Evoque Convertible is only available with a restricted choice of the 180hp 2.0 TD4 Ingenium diesel unit or the 2.0-litre Si4 petrol engine in 240hp and 290hp outputs. 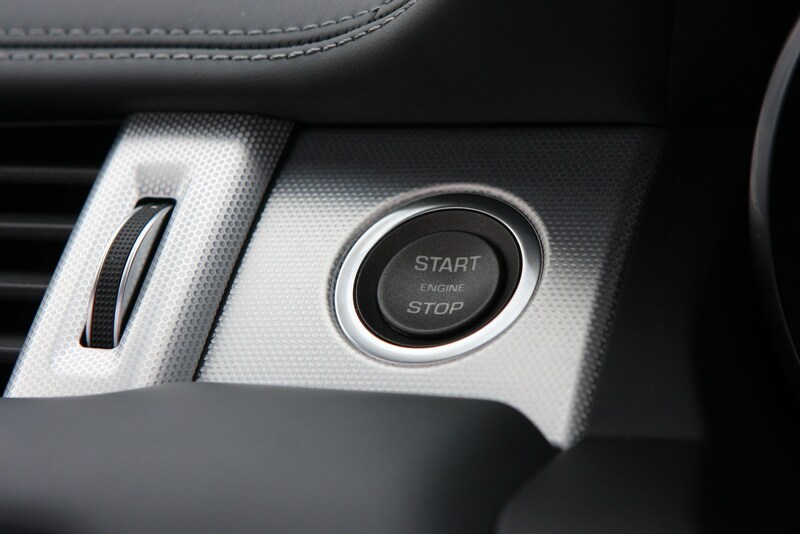 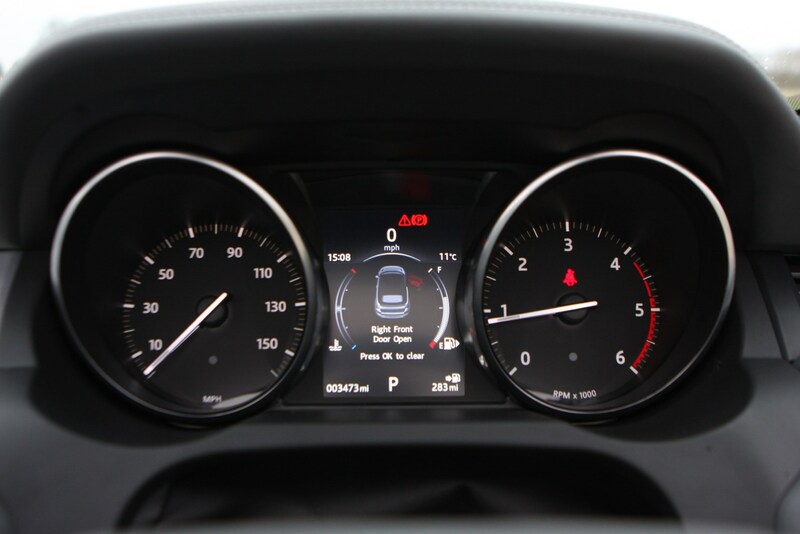 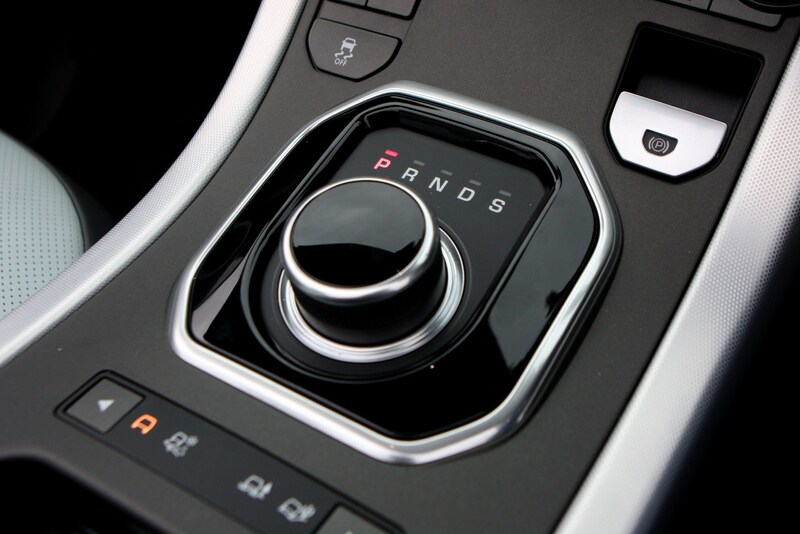 Both are paired to the familiar nine-speed automatic gearbox driving all four wheels. 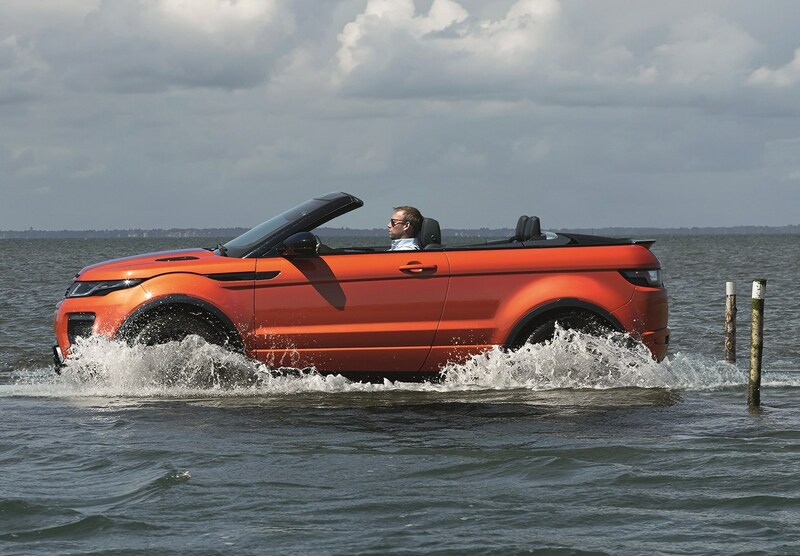 Off-road excursions prove that the Convertible is a bona fide Land Rover over rougher terrain and is no less capable than other Evoques despite its lack of roof. 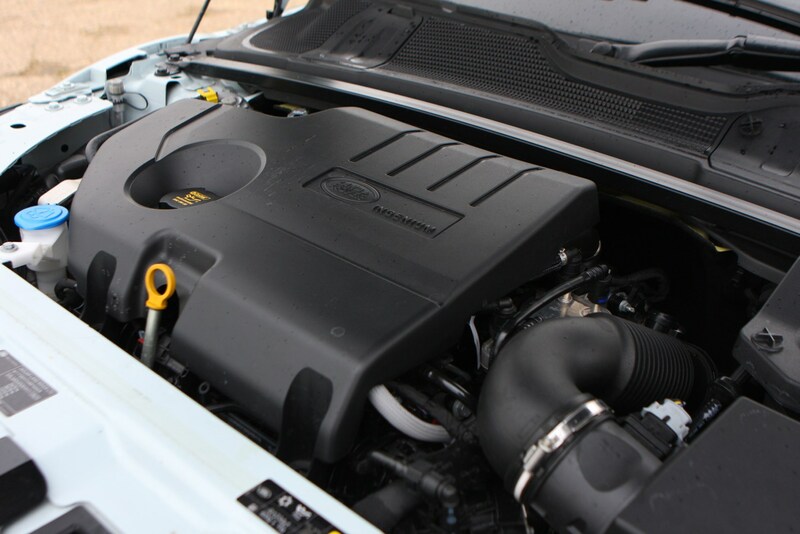 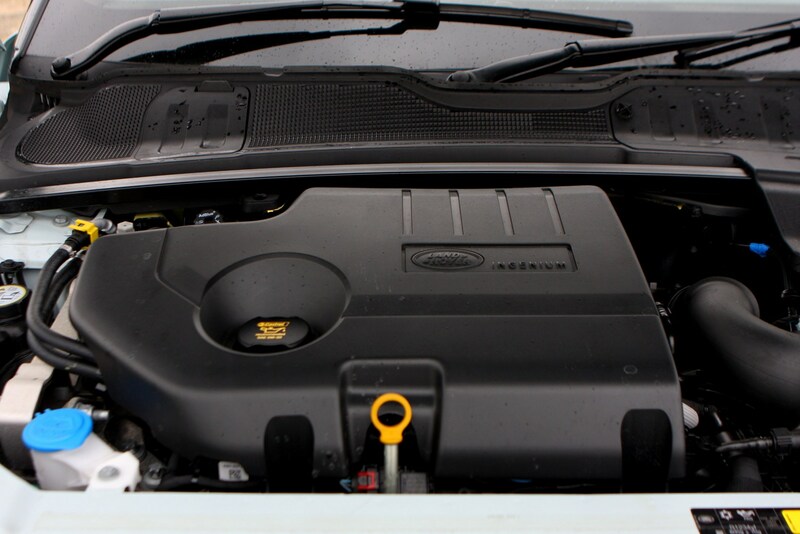 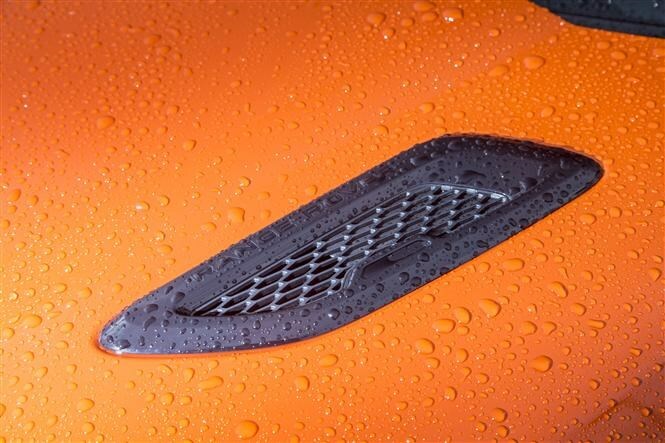 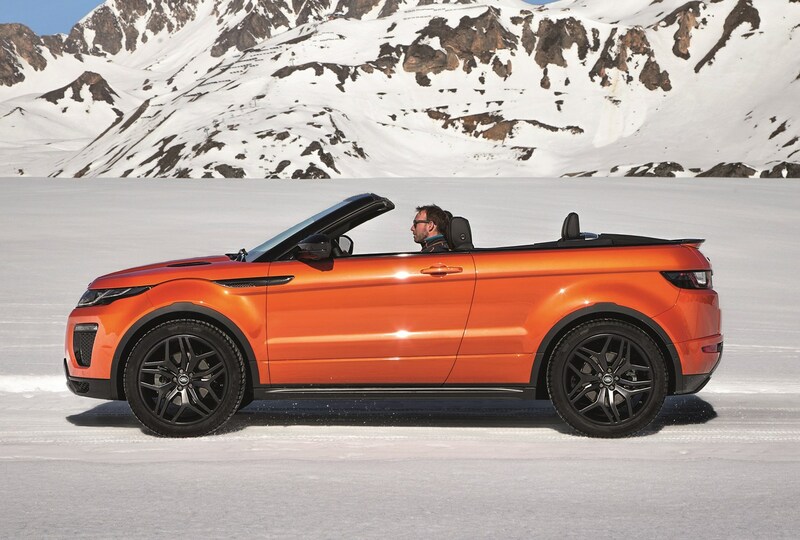 That additional weight means both performance and efficiency suffer compared with the hard-top Evoques. 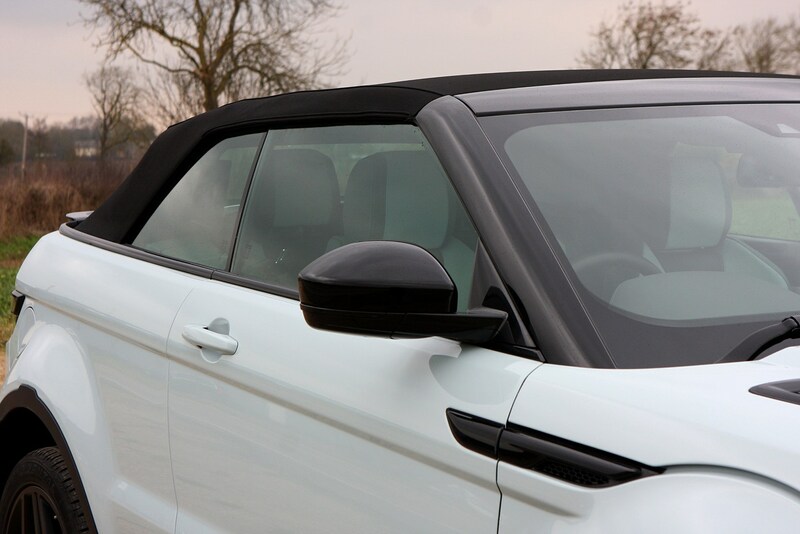 However, the TD4’s 0-62mph sprint is 1.3 seconds slower in the Convertible than in the Coupe, while CO2 emissions are also inferior to the hard-top’s, jumping from 129g/km to 149g/km. 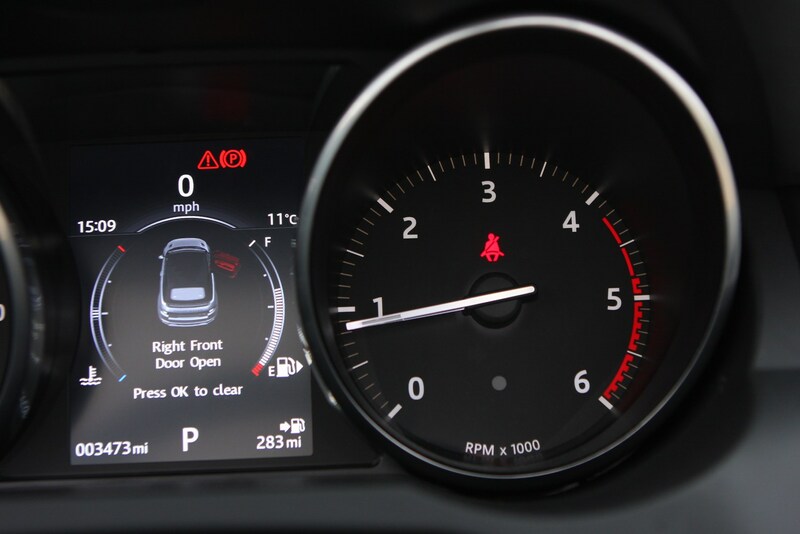 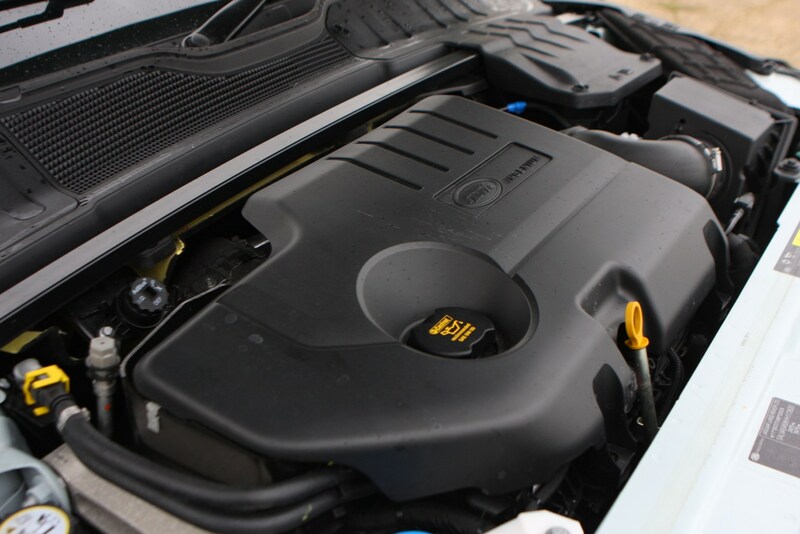 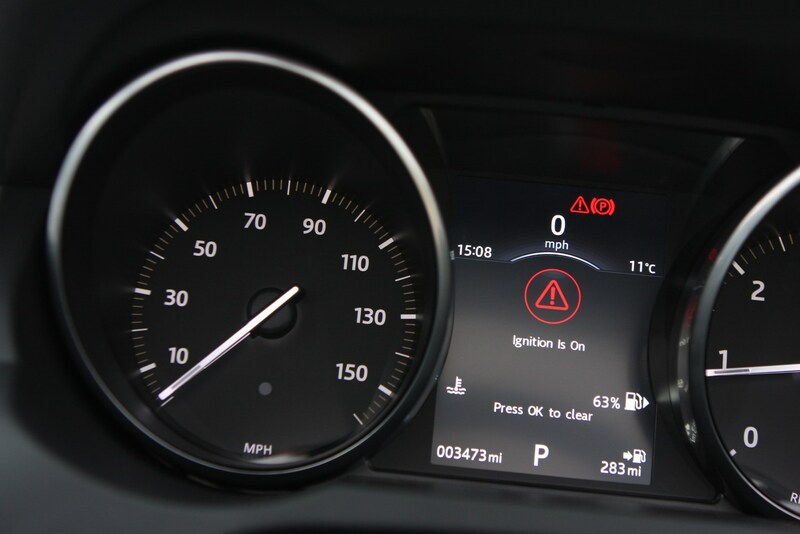 The Si4 petrol’s quicker but with a claimed average fuel economy of 32.9mpg and emissions of 201g/km, it’s only a sensible choice if you cover low annual mileages. 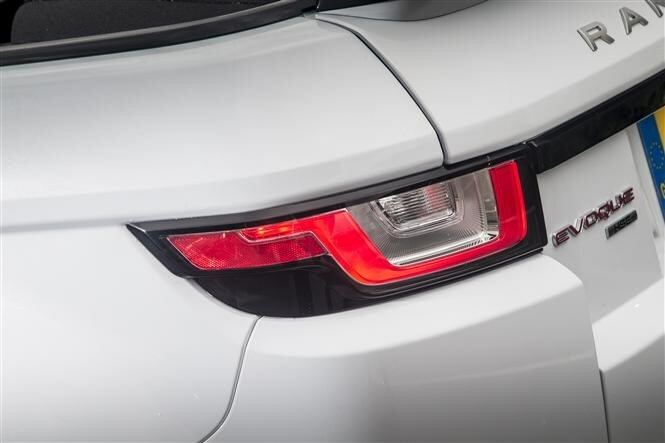 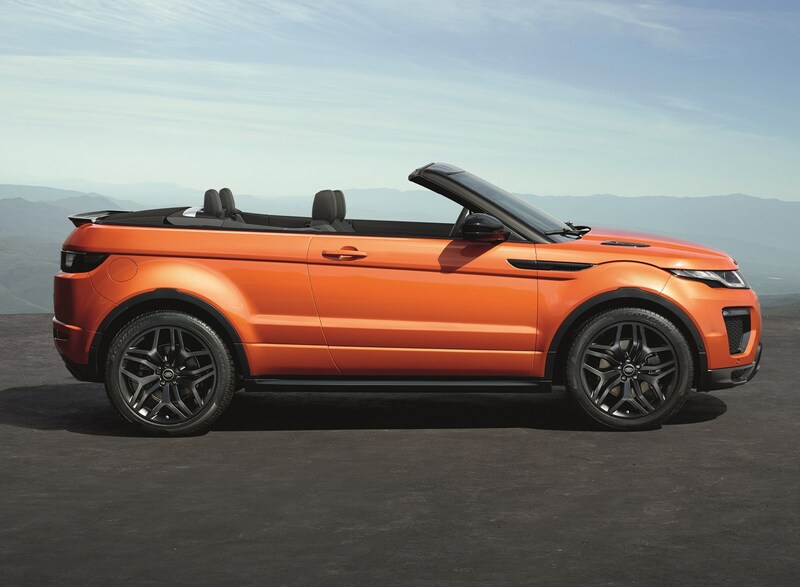 In line with its position at the pinnacle of the Range Rover Evoque hierarchy, the new Convertible will only come in high-end HSE Dynamic and HSE Dynamic Lux trims. 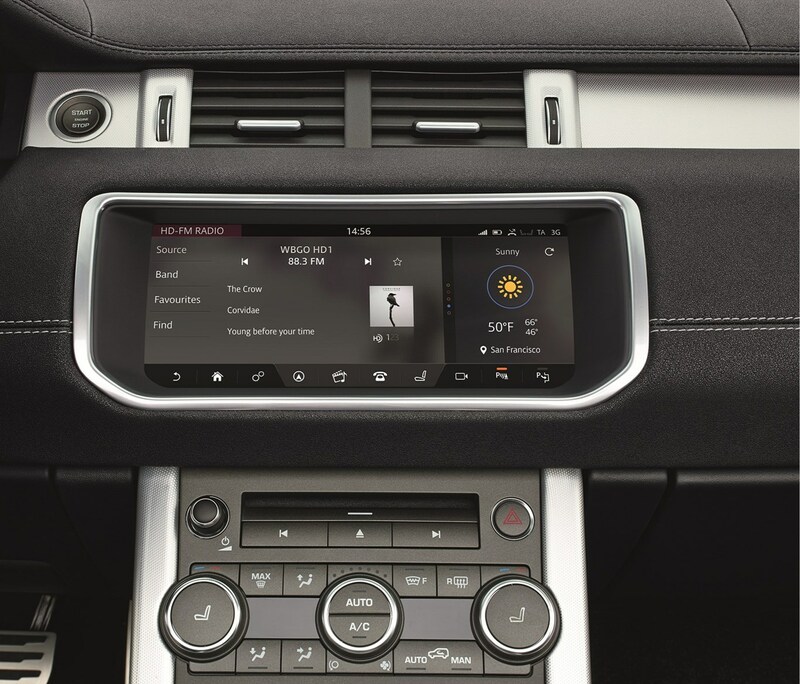 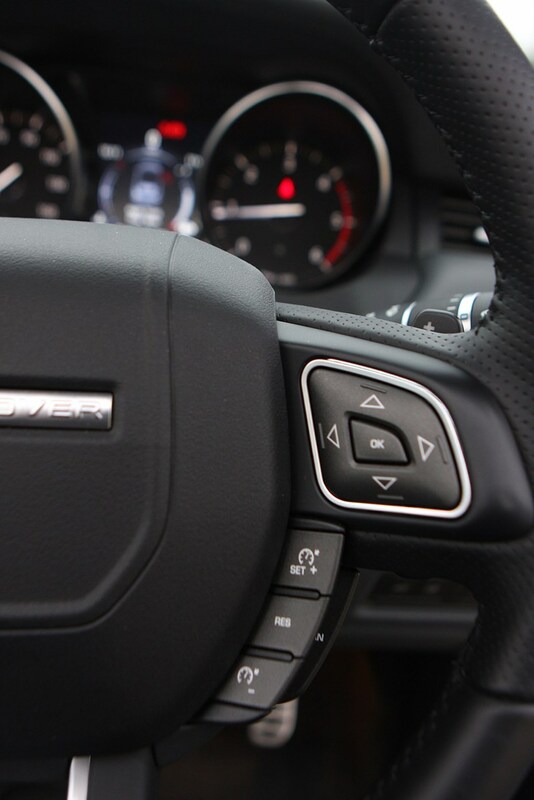 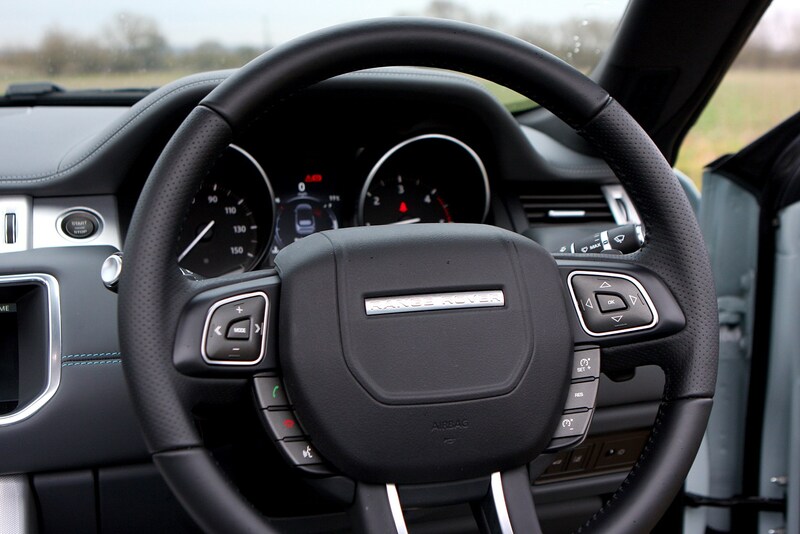 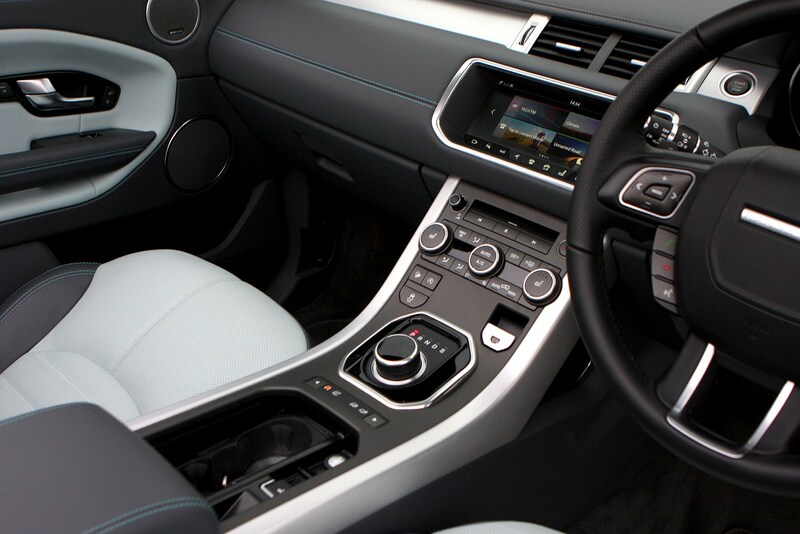 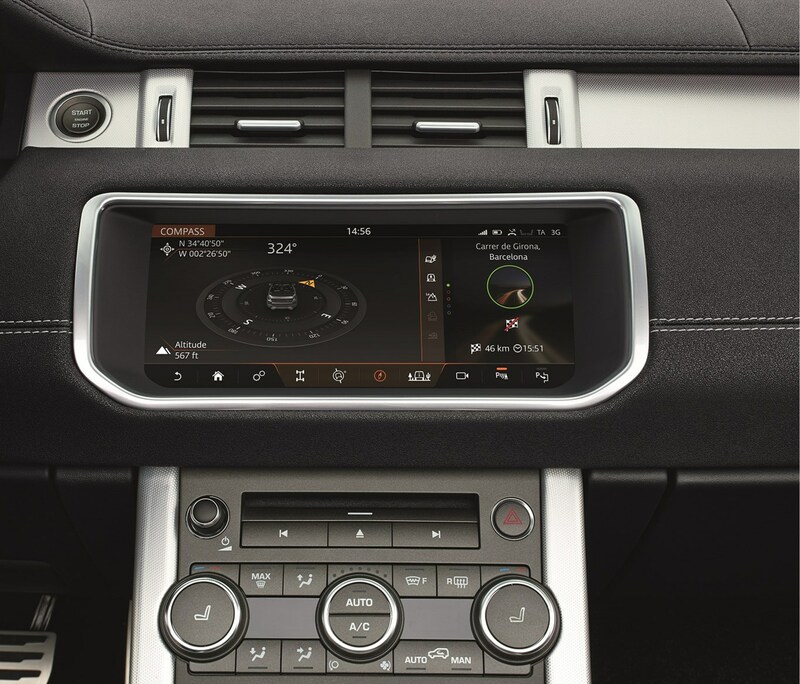 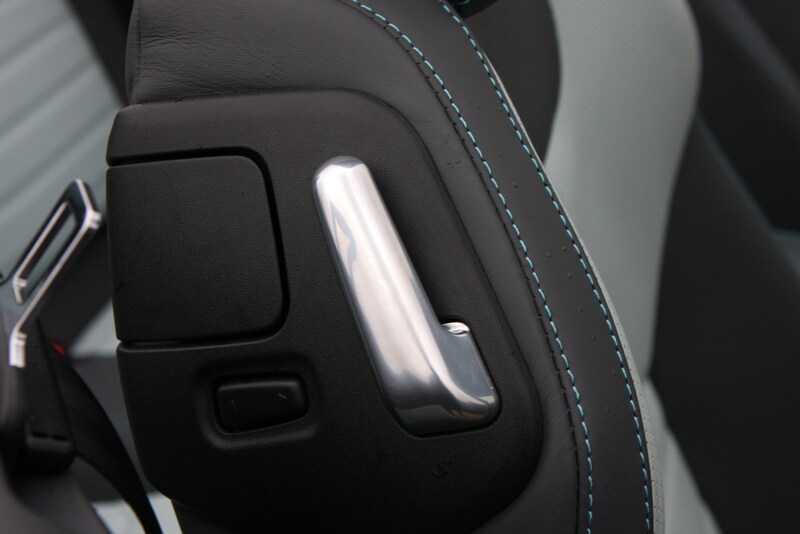 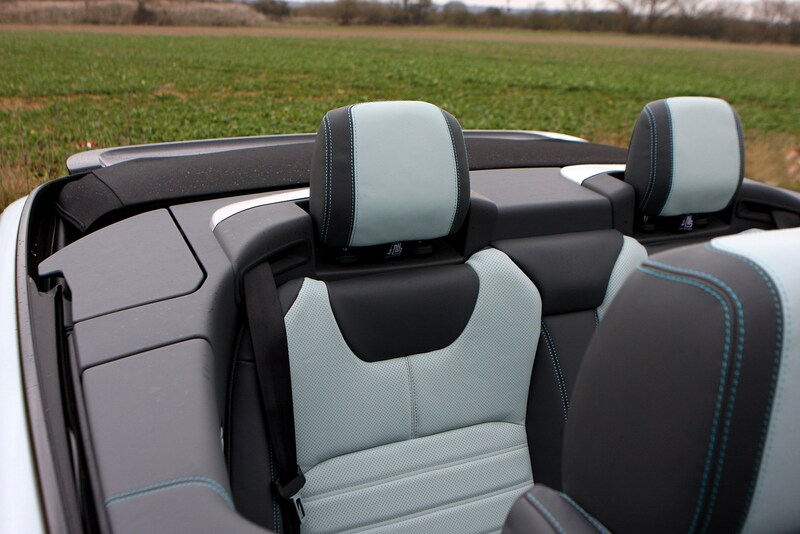 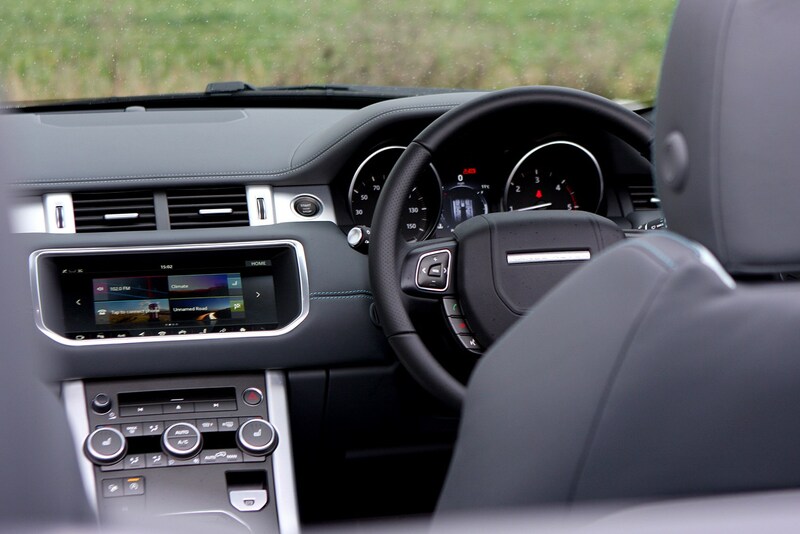 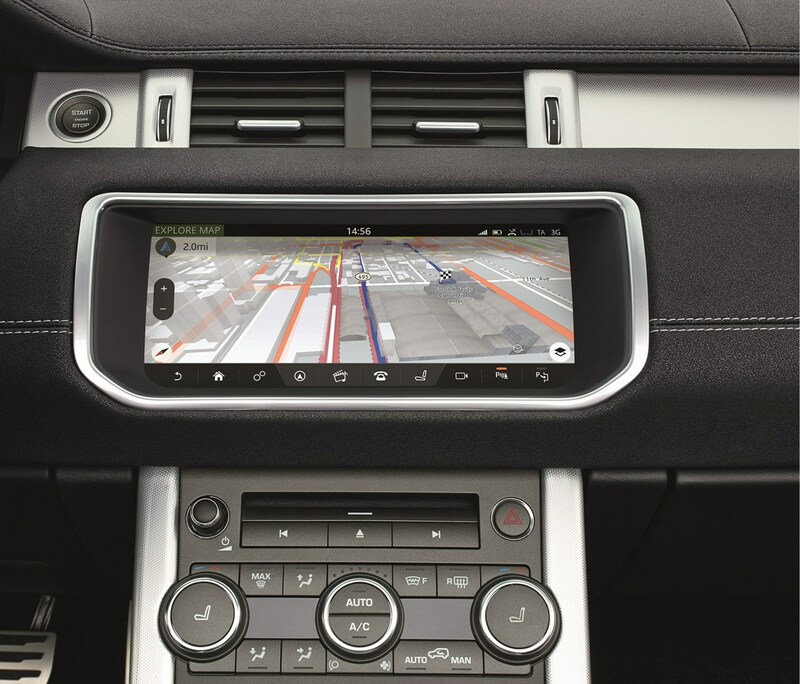 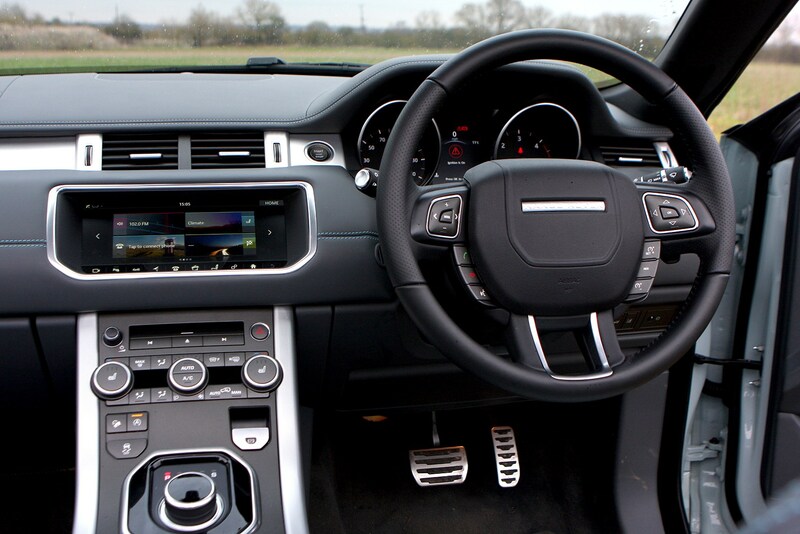 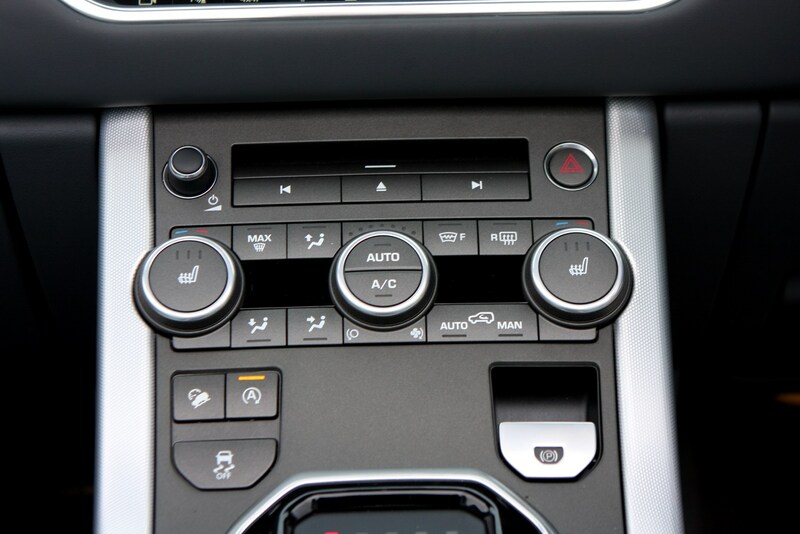 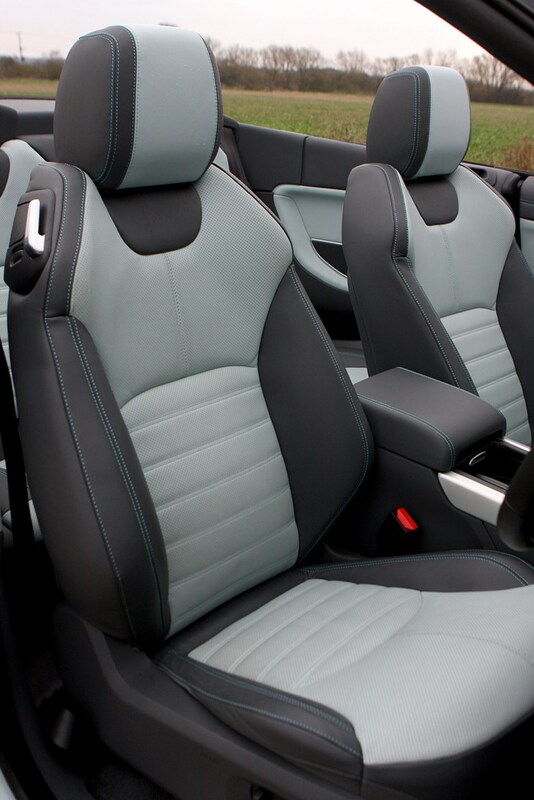 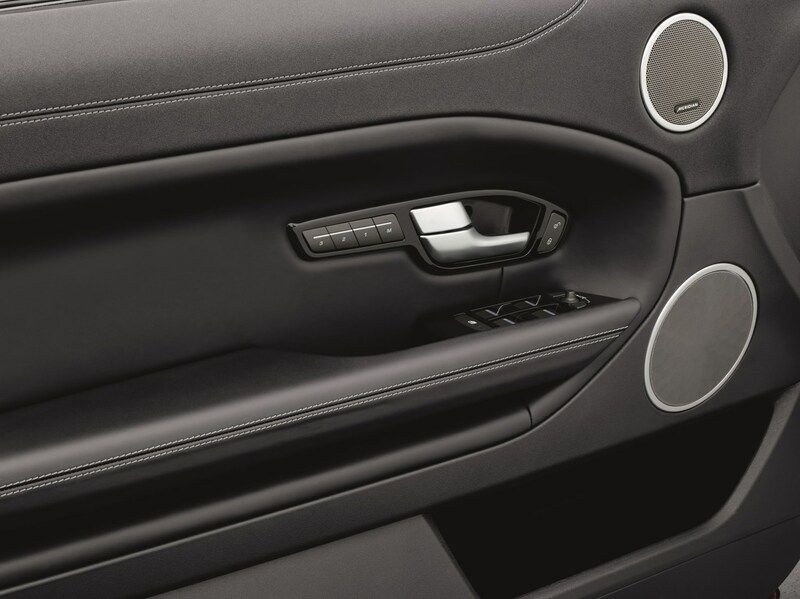 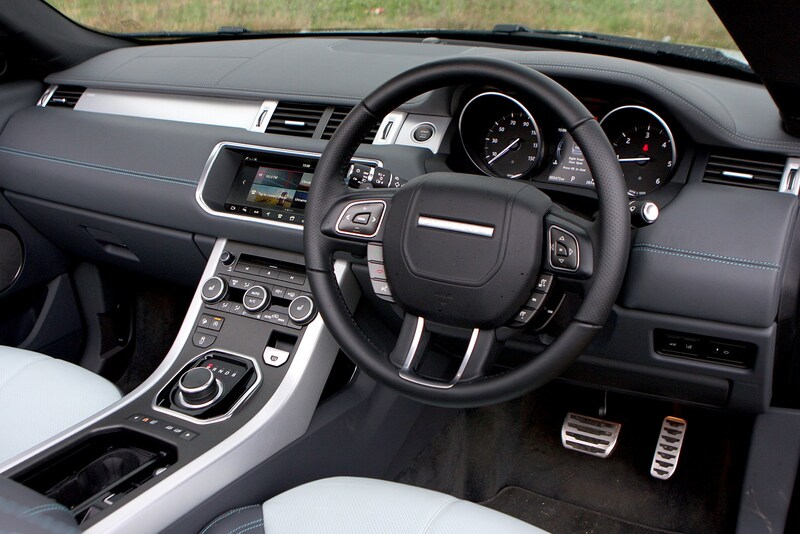 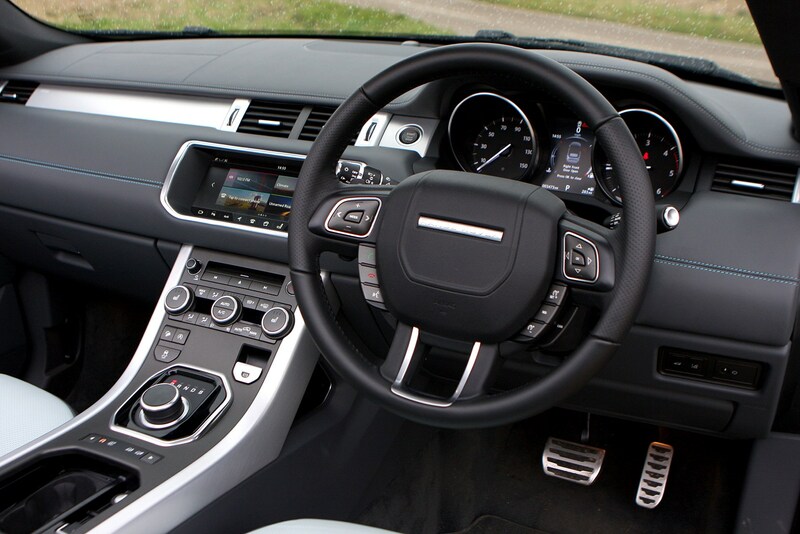 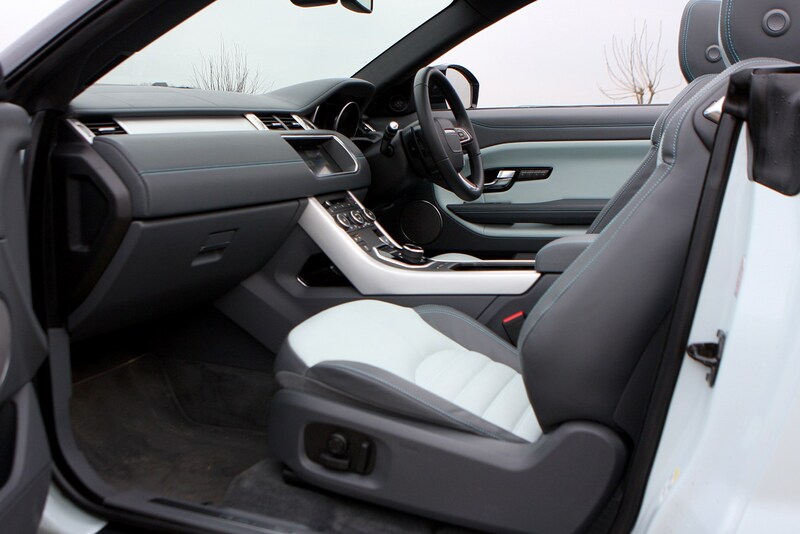 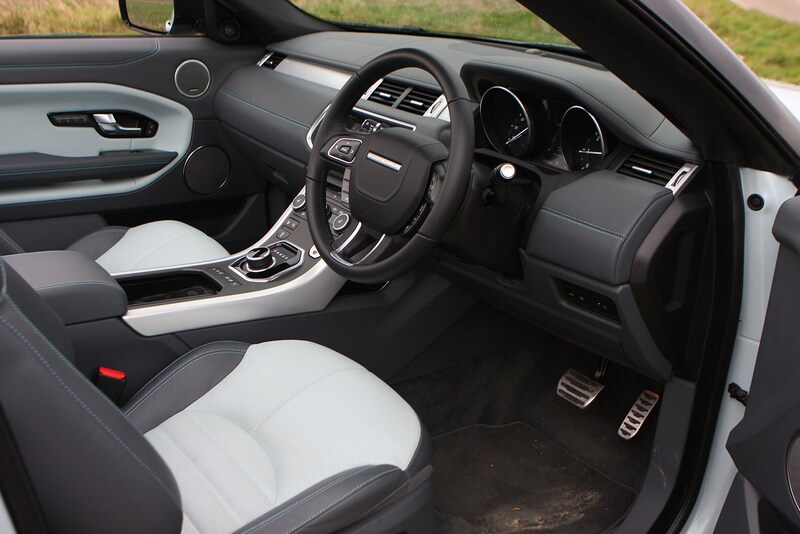 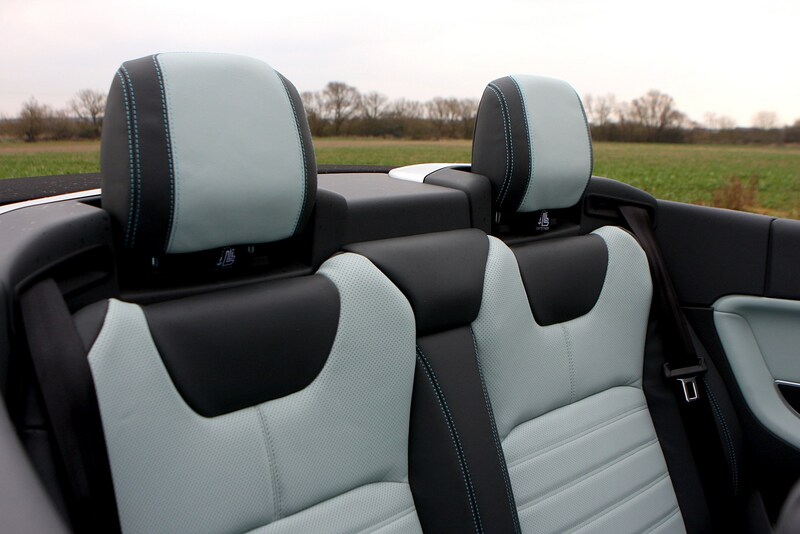 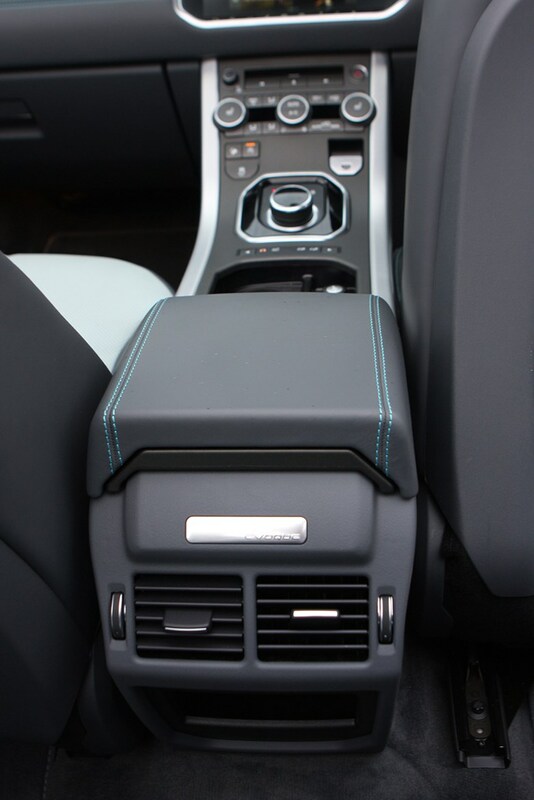 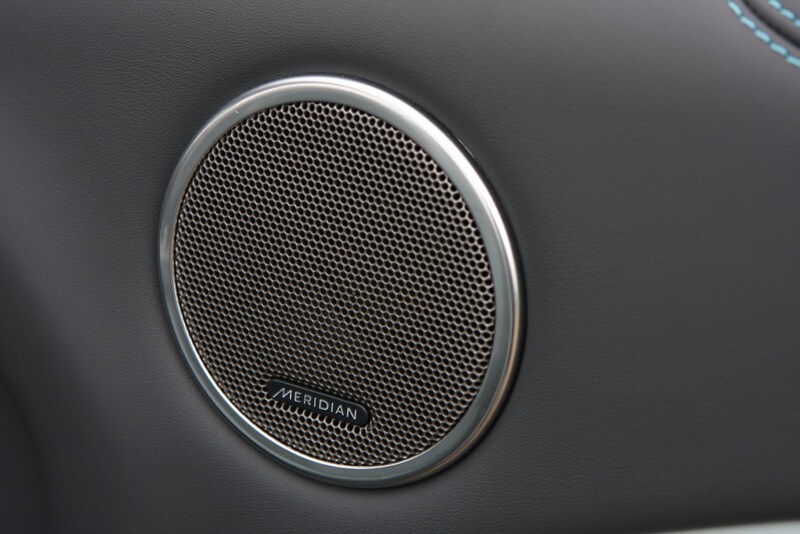 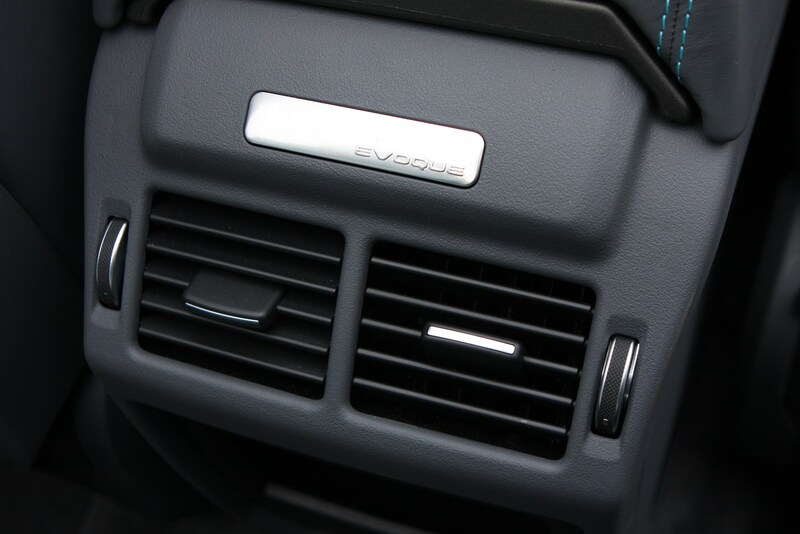 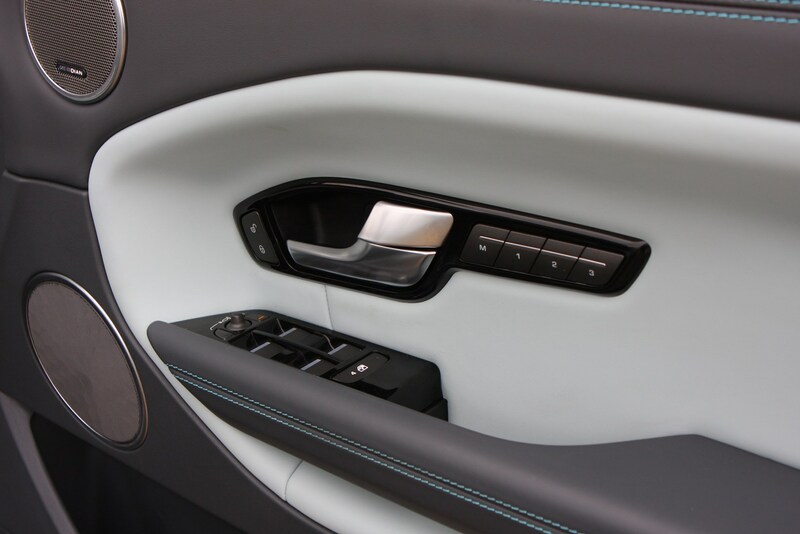 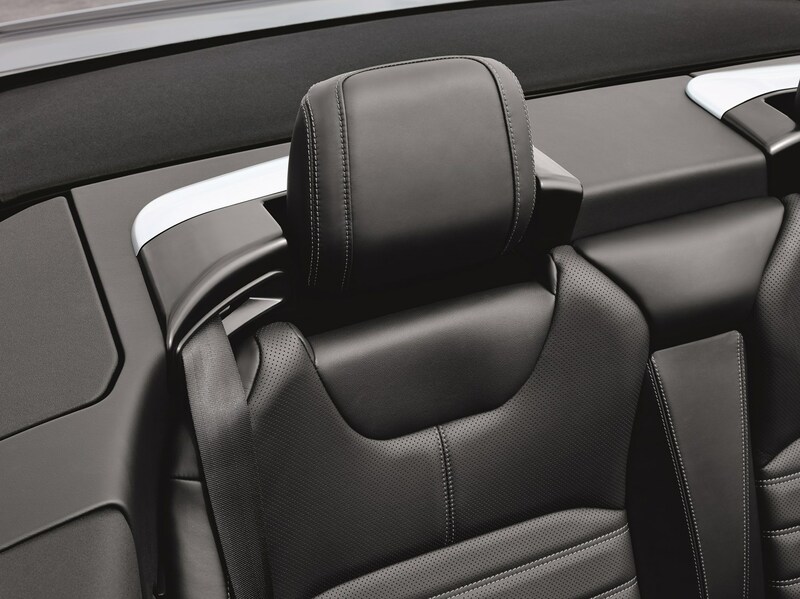 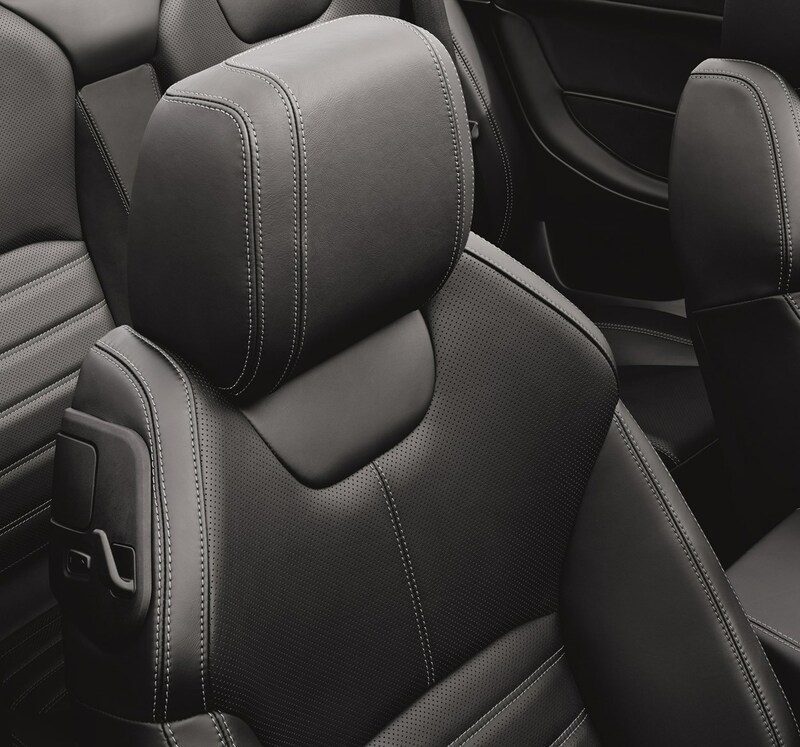 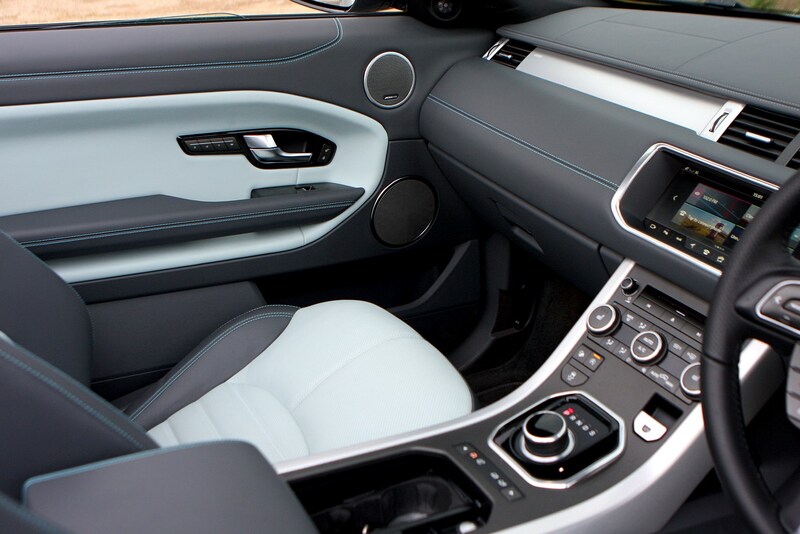 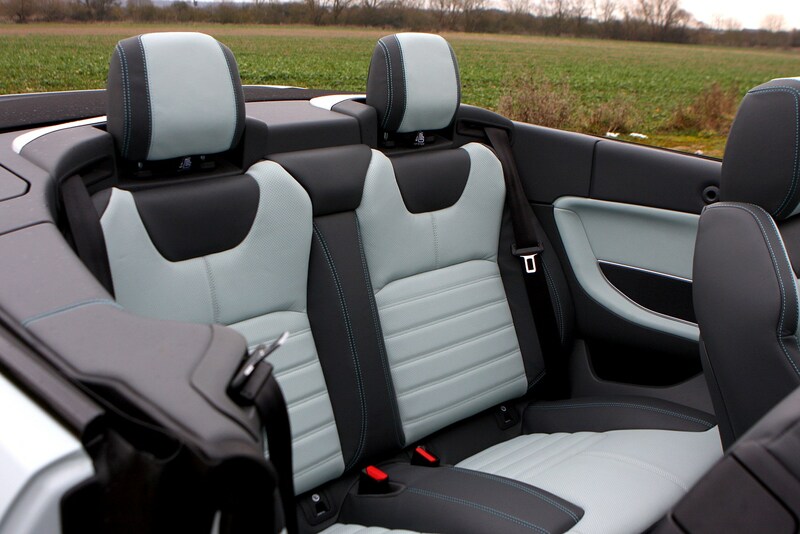 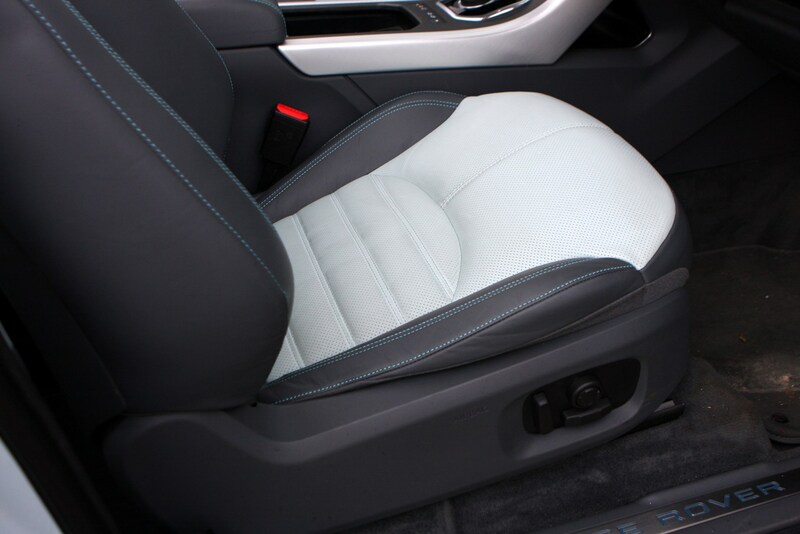 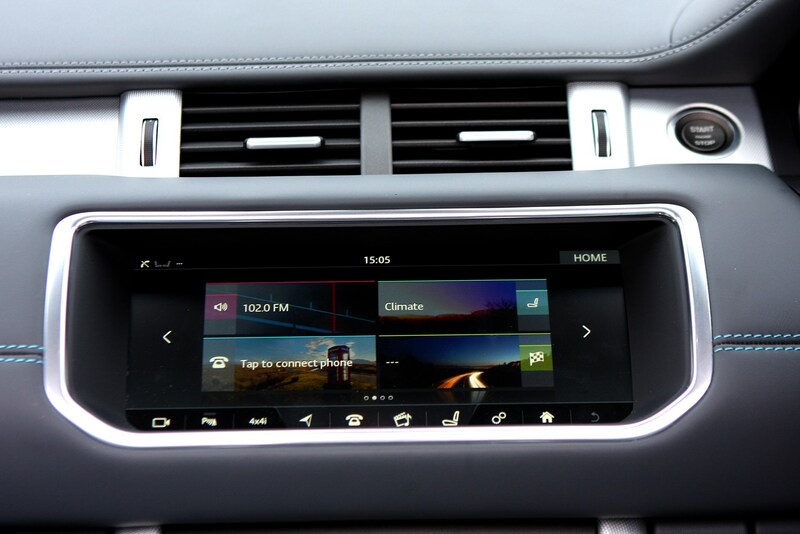 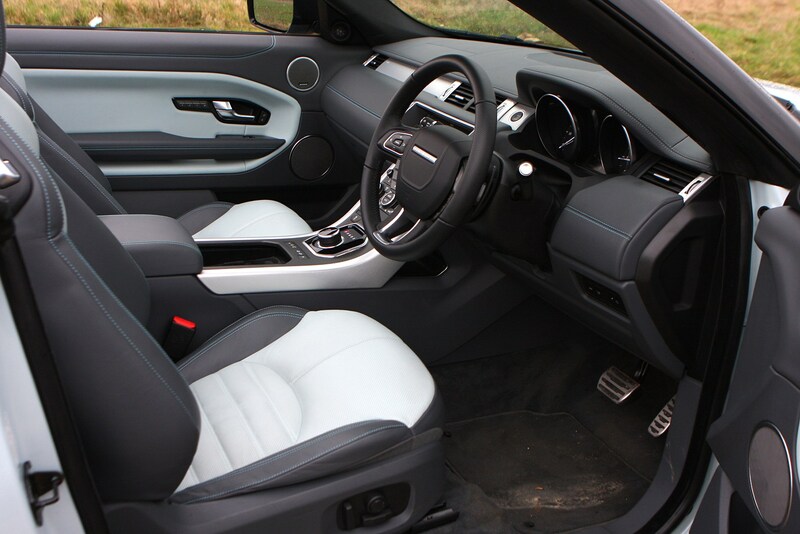 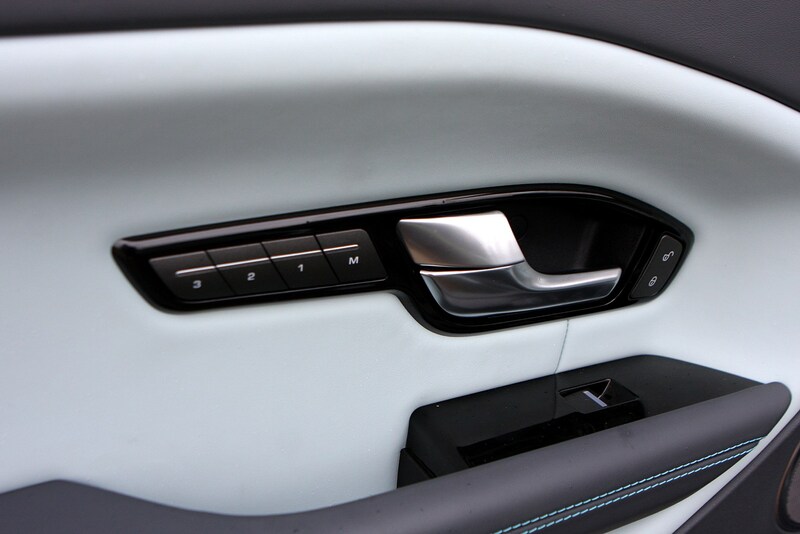 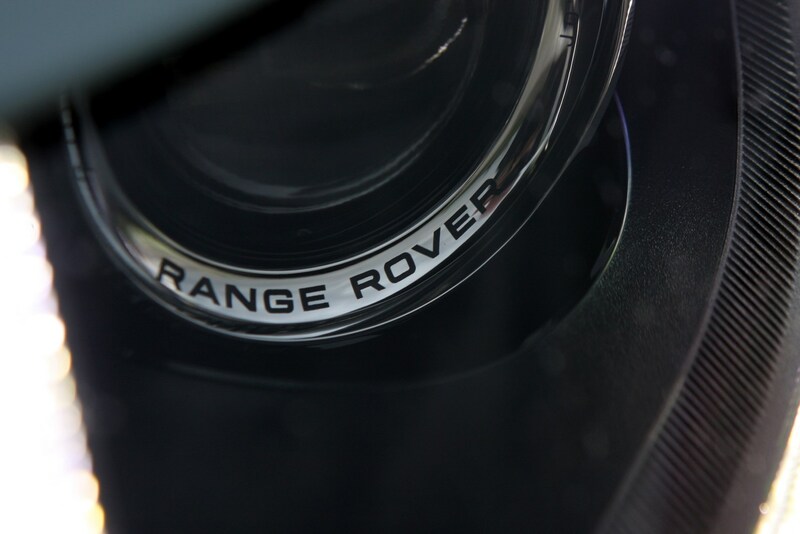 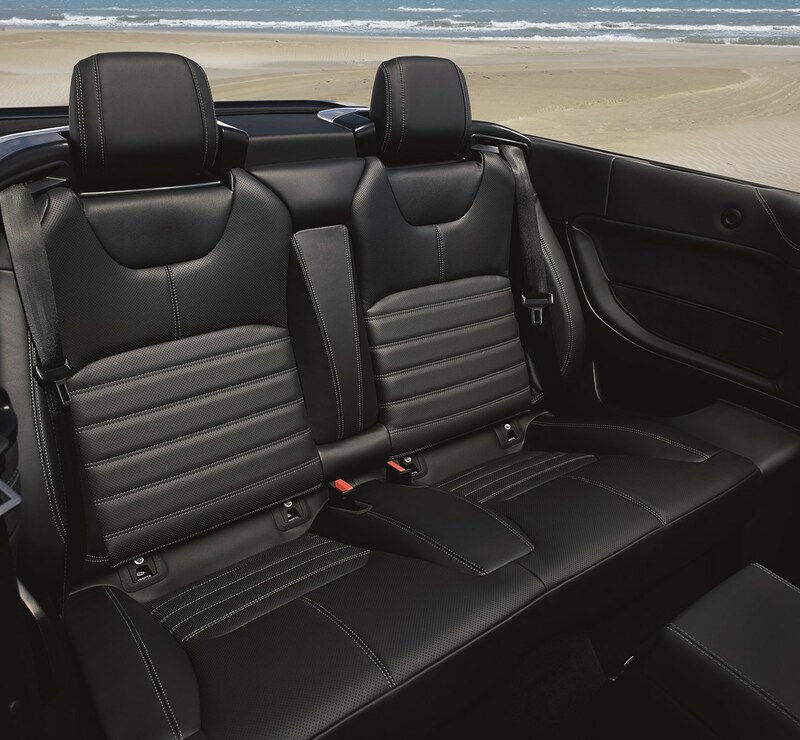 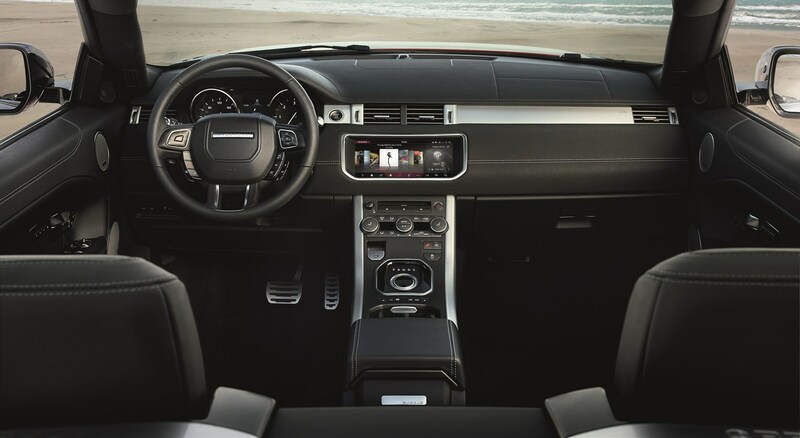 Featuring the upgraded interior hard-top Evoques enjoyed from their mid-life facelift, with increased use of leather for the dashboard and door panels, the Convertible also debuted the 10.2-inch InControl Touch Pro infotainment system in a Land Rover. 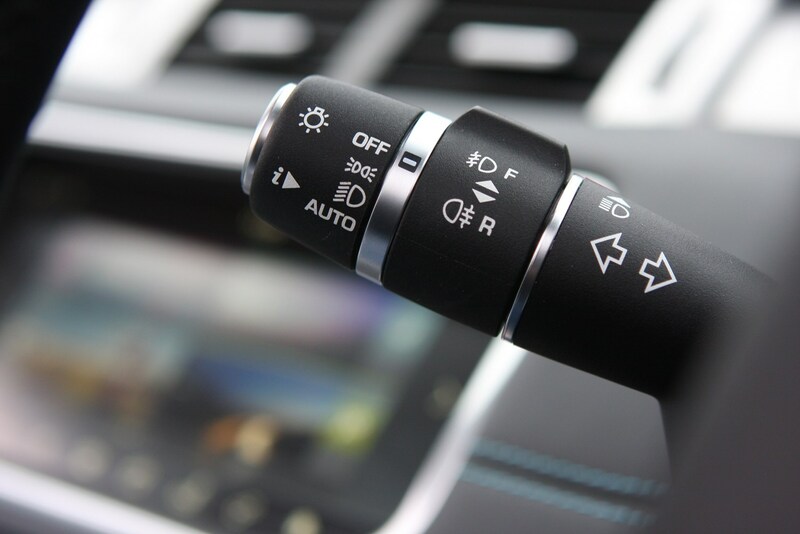 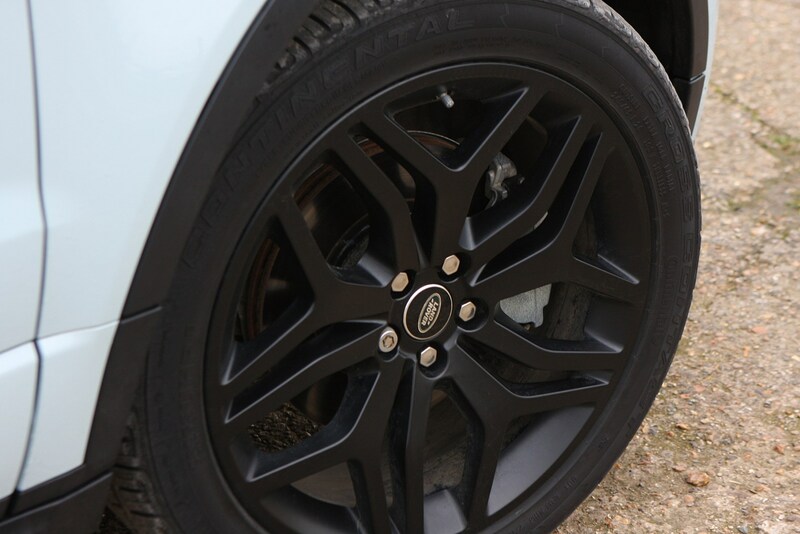 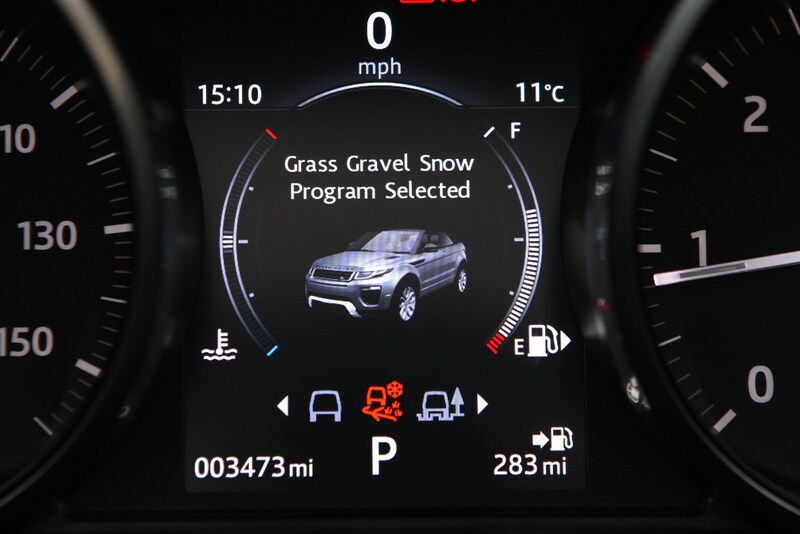 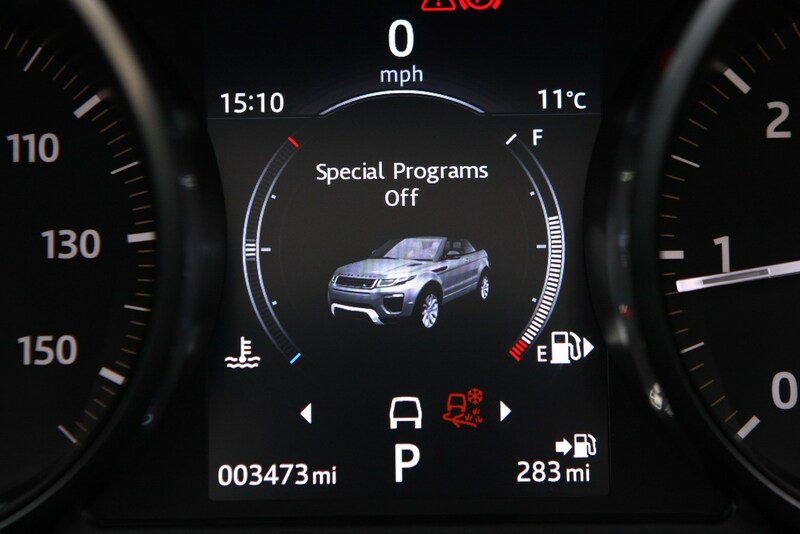 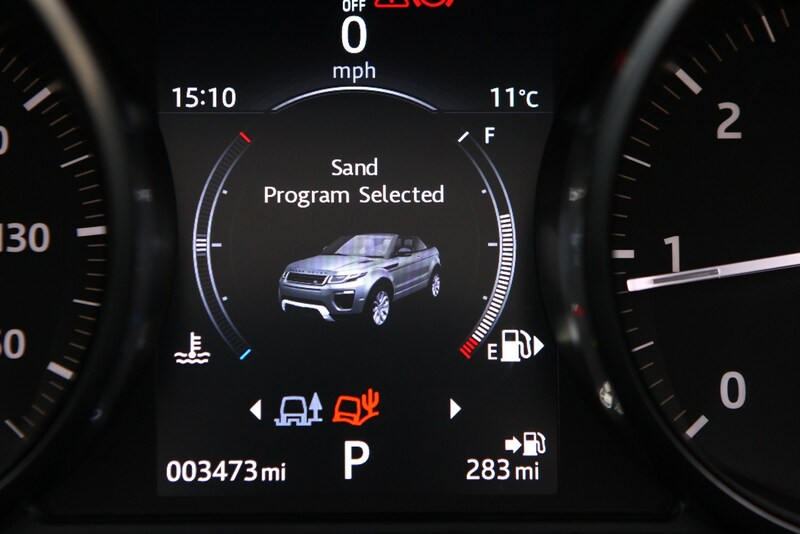 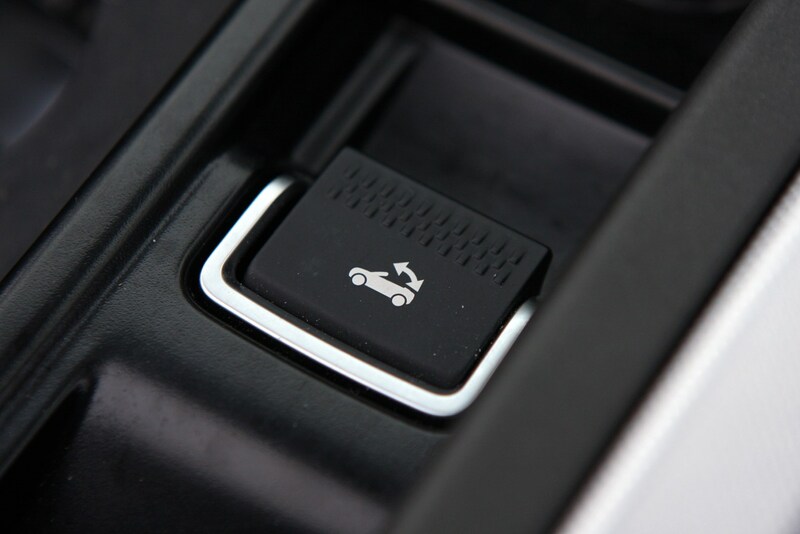 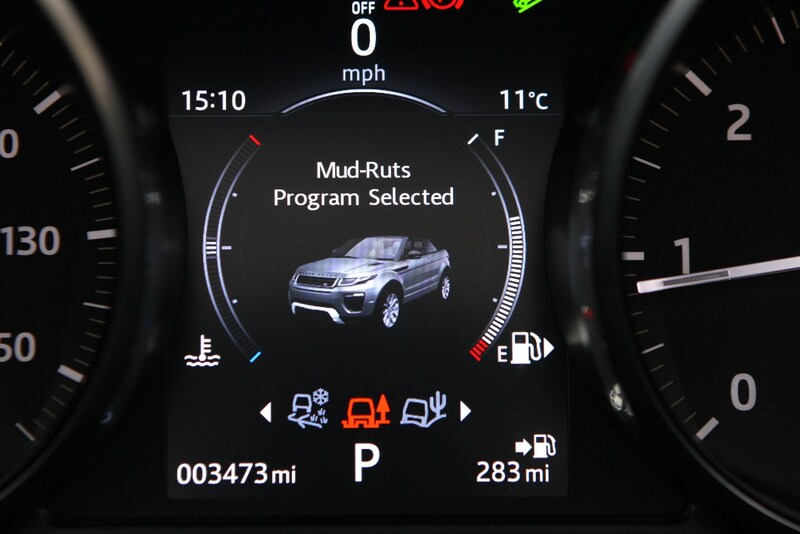 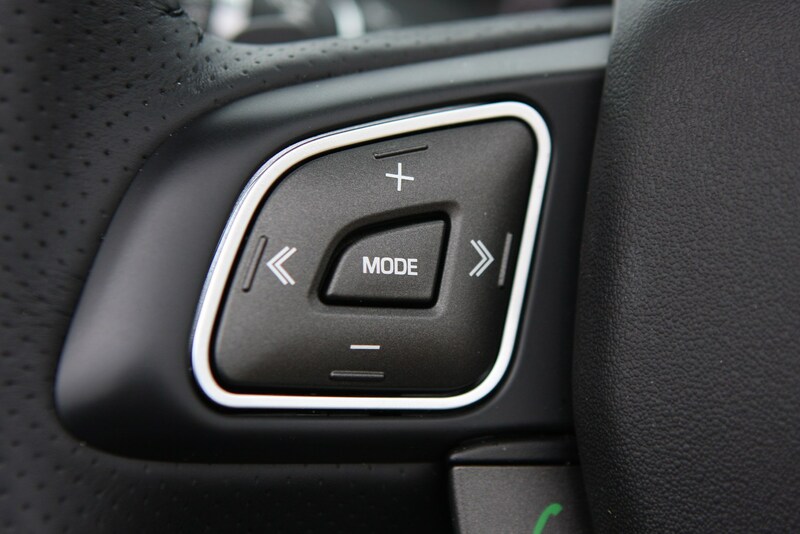 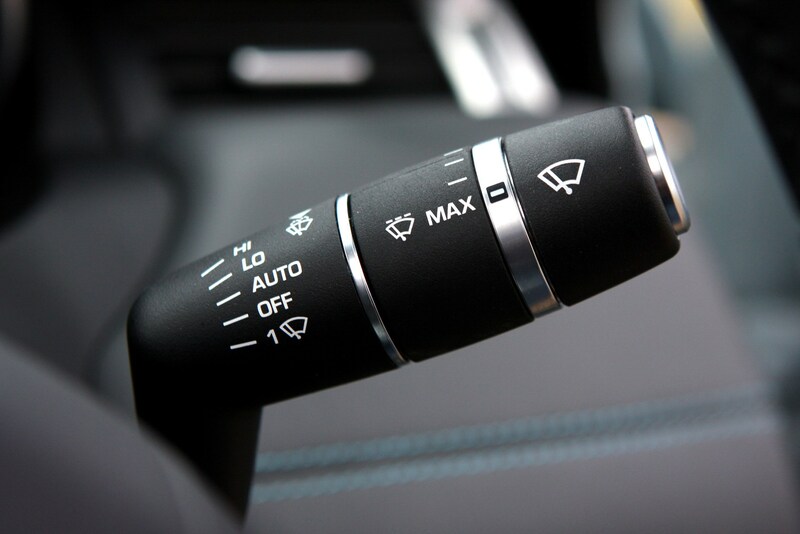 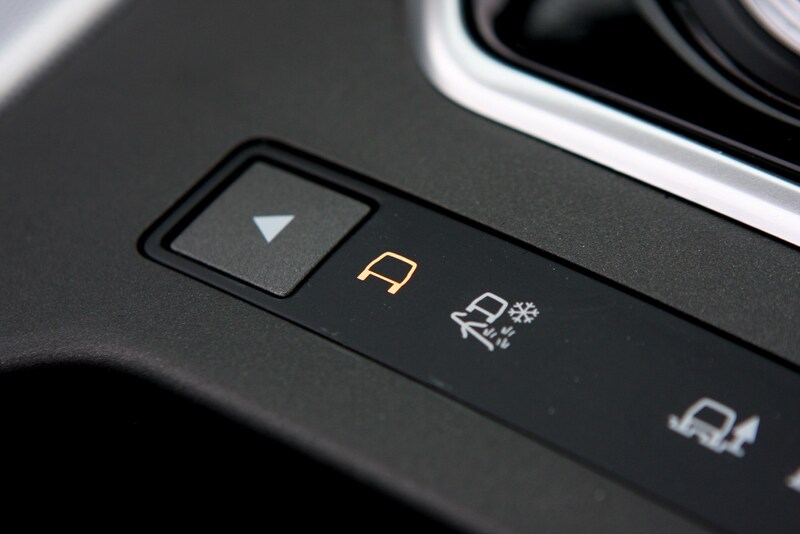 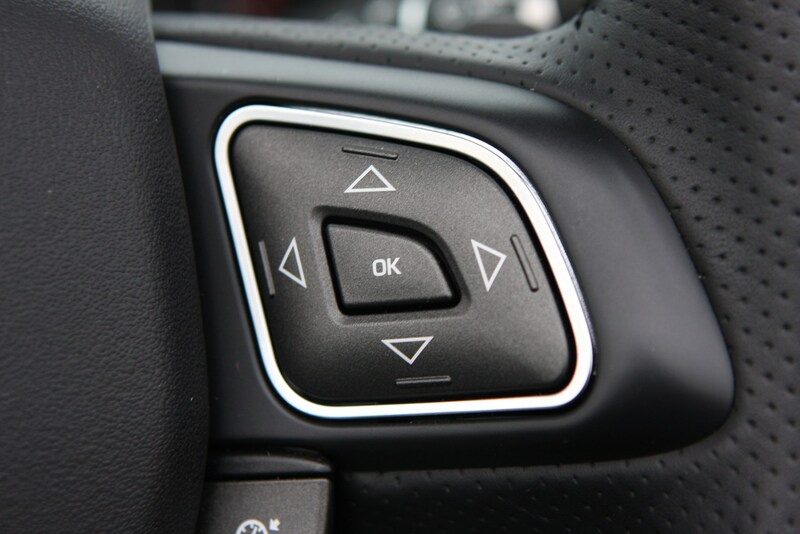 The Evoque Convertible’s version also features displays for off-roading functions, such as wading depth when traversing rivers. 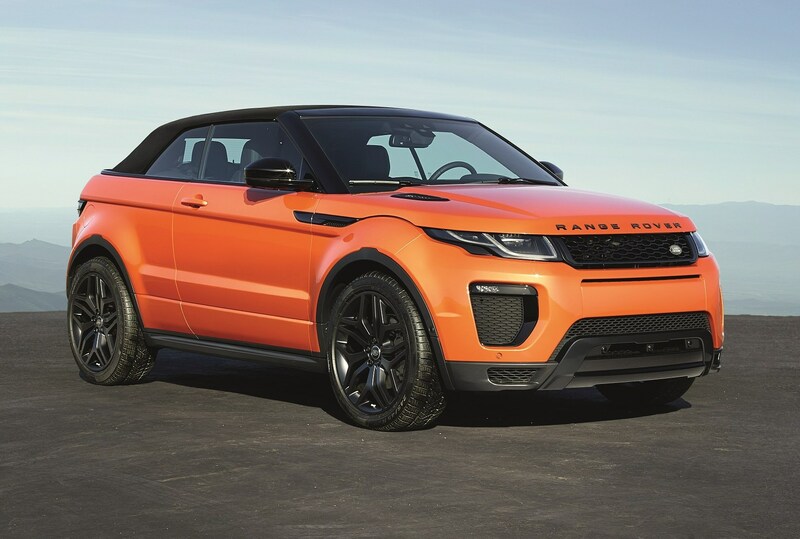 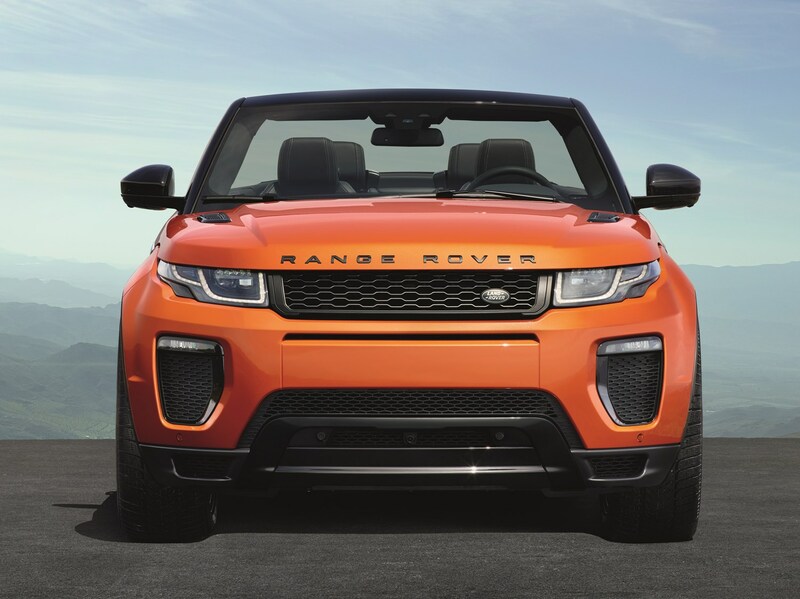 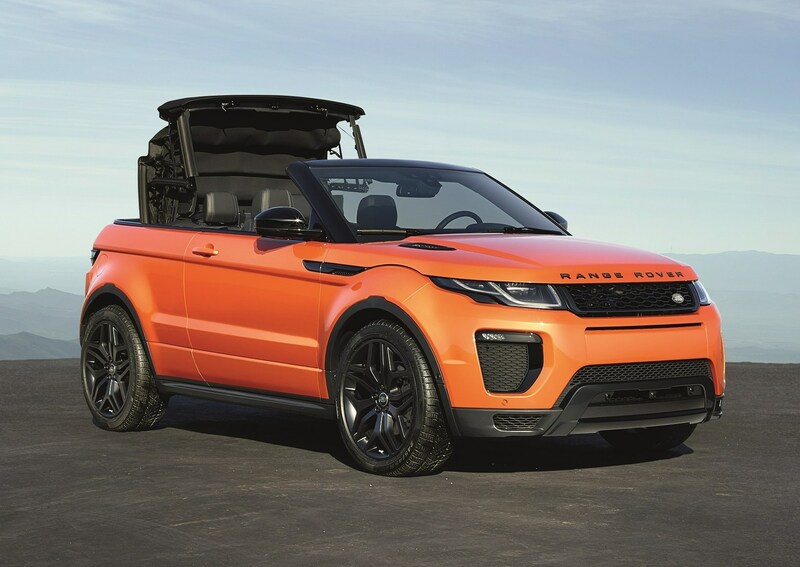 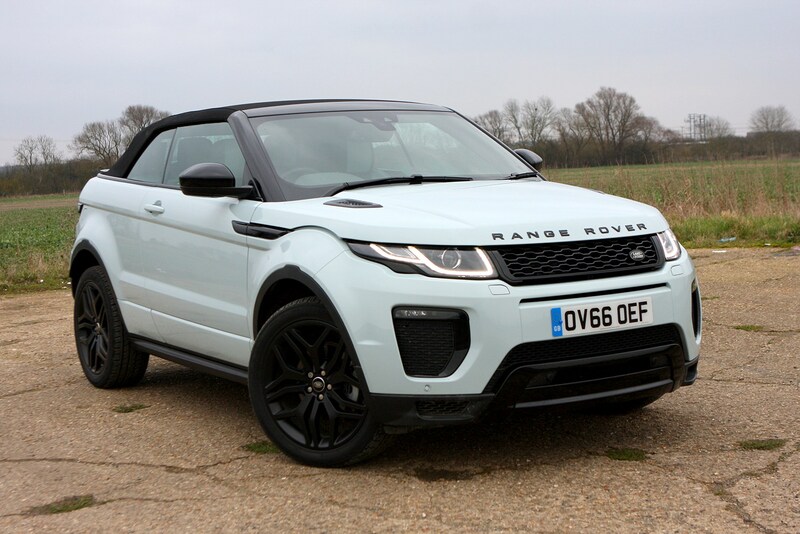 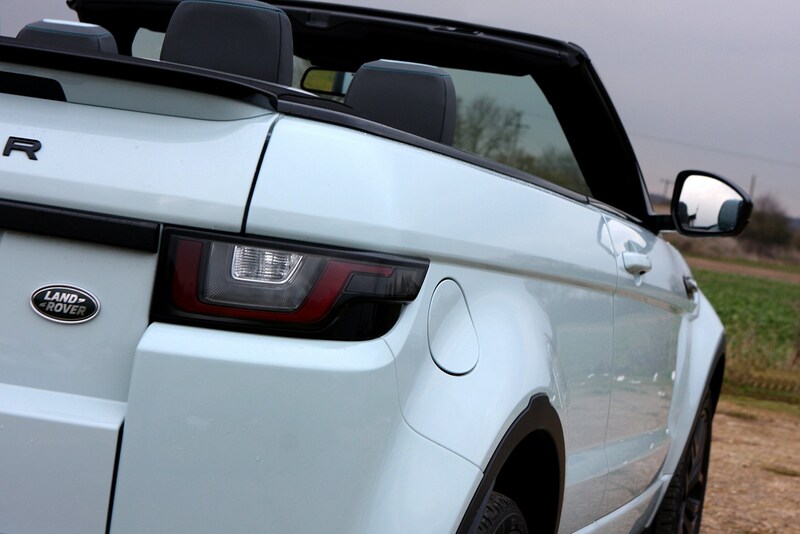 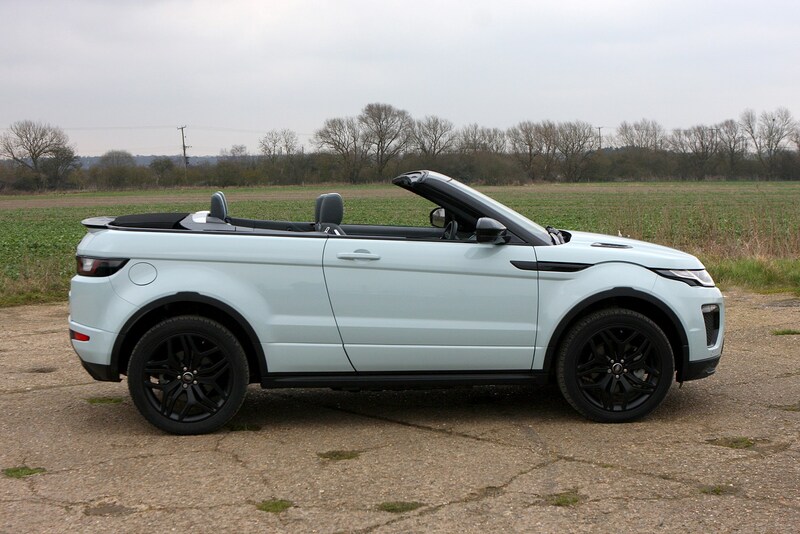 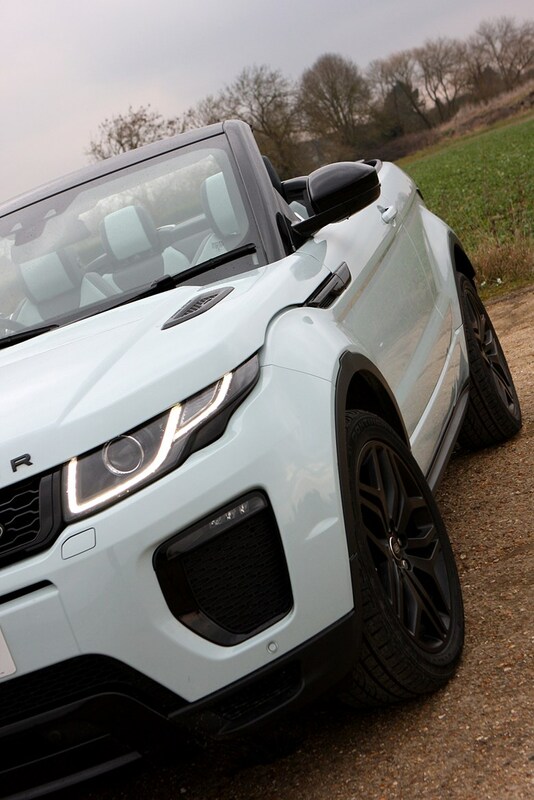 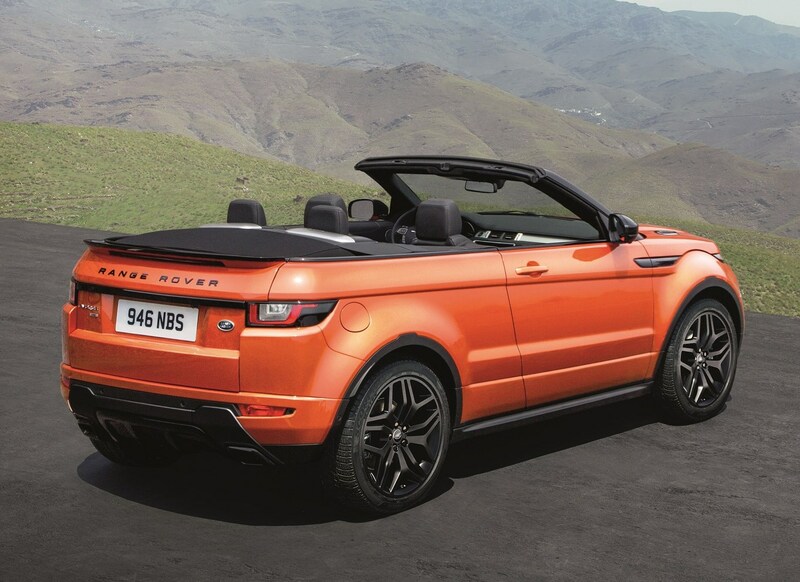 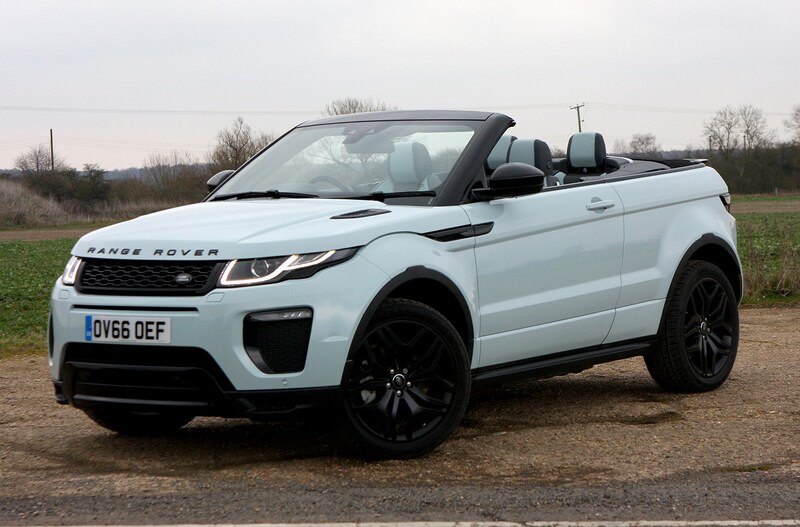 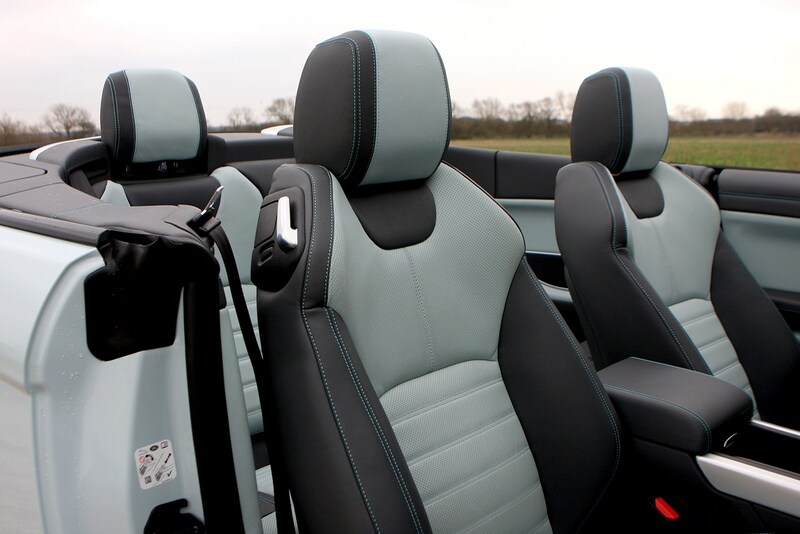 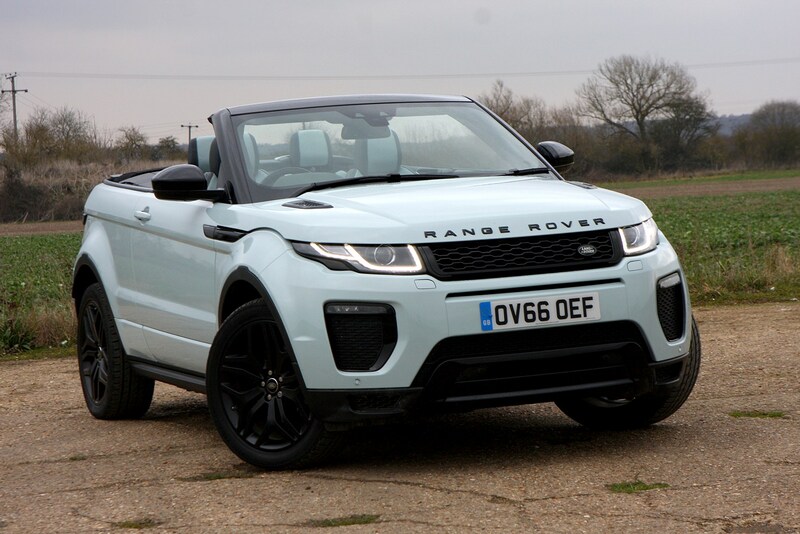 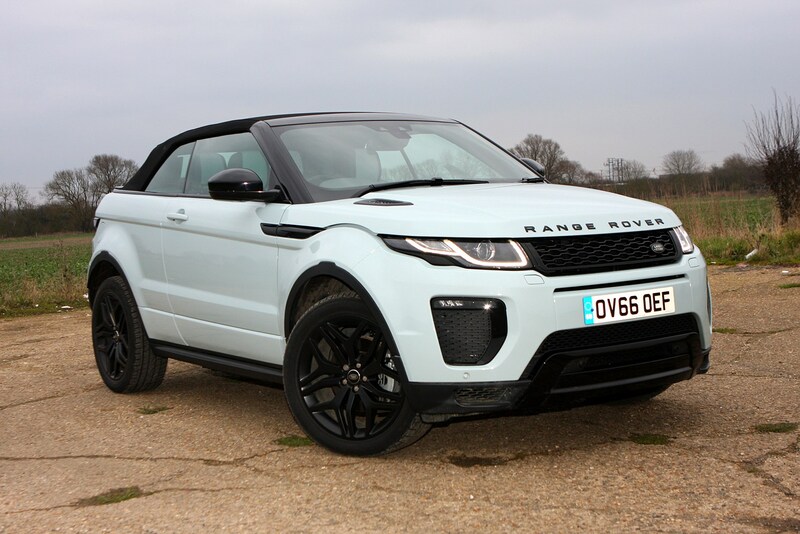 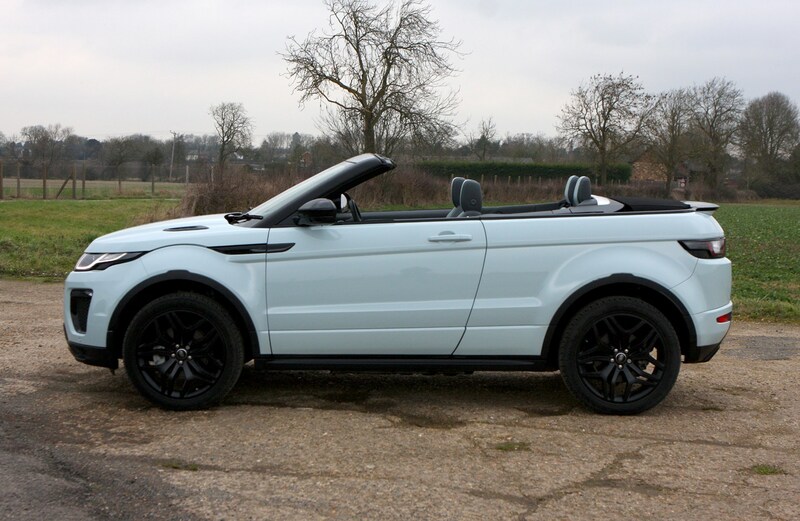 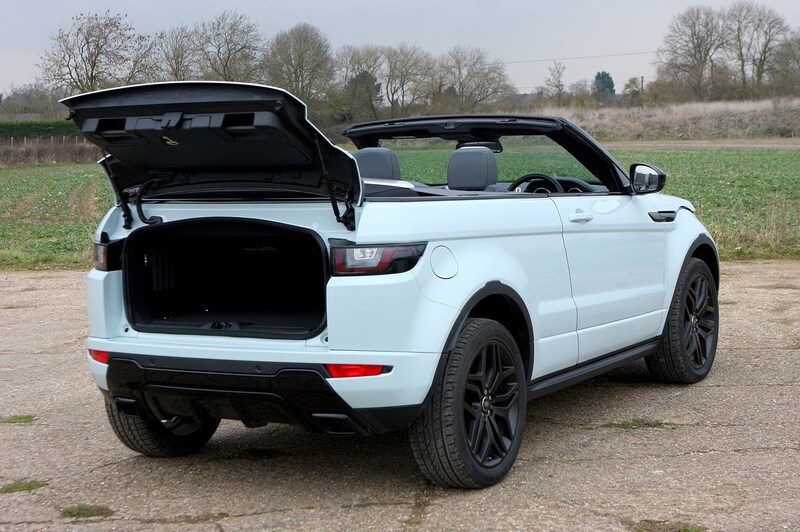 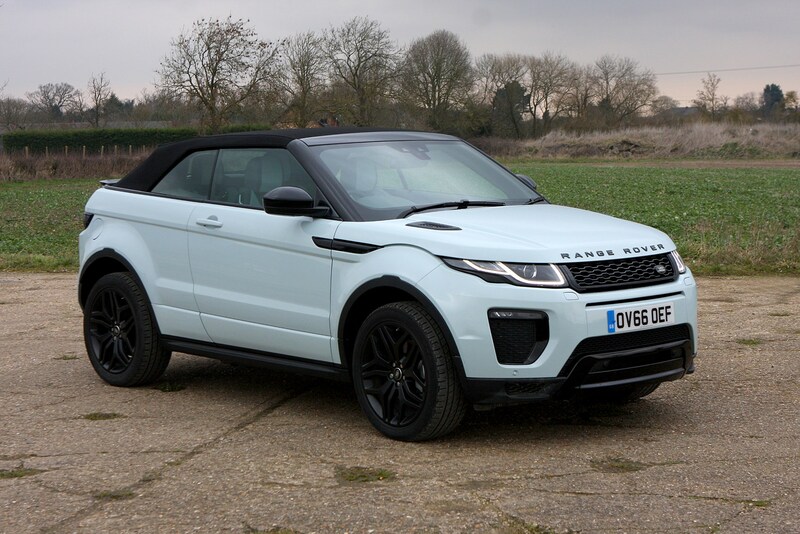 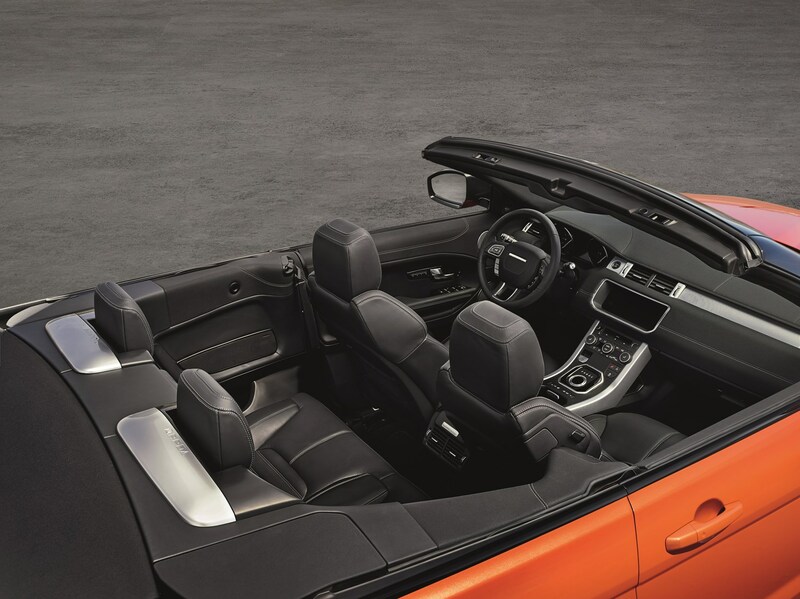 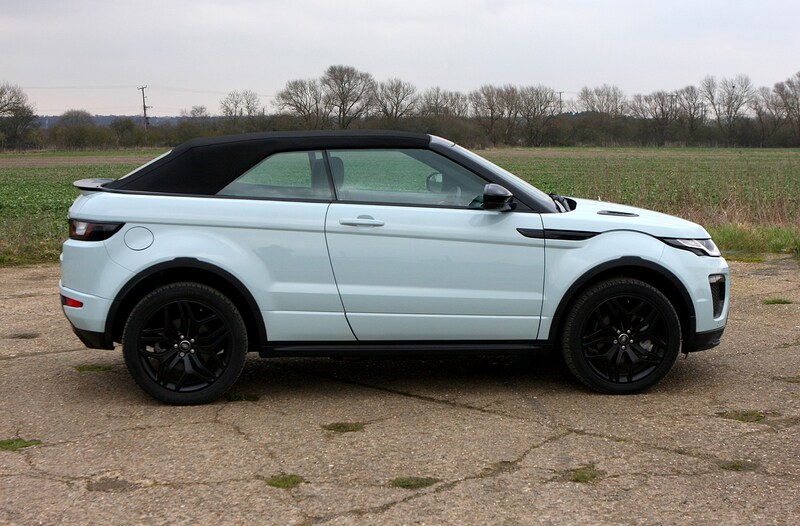 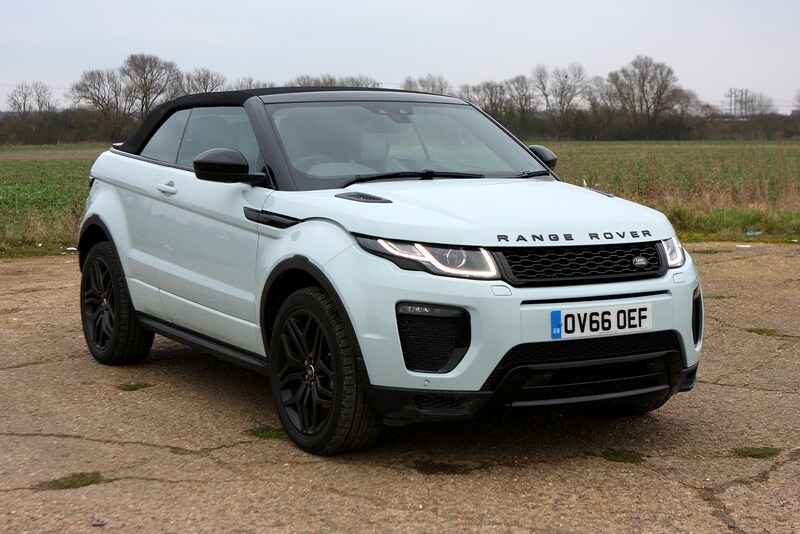 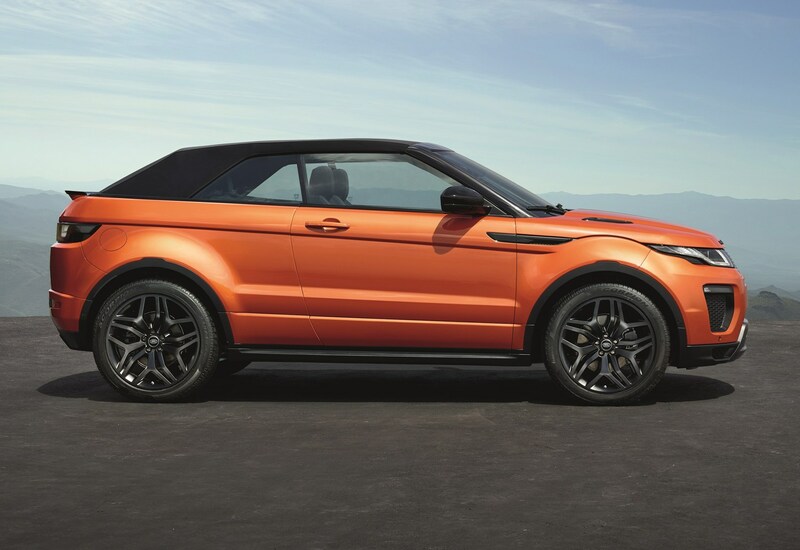 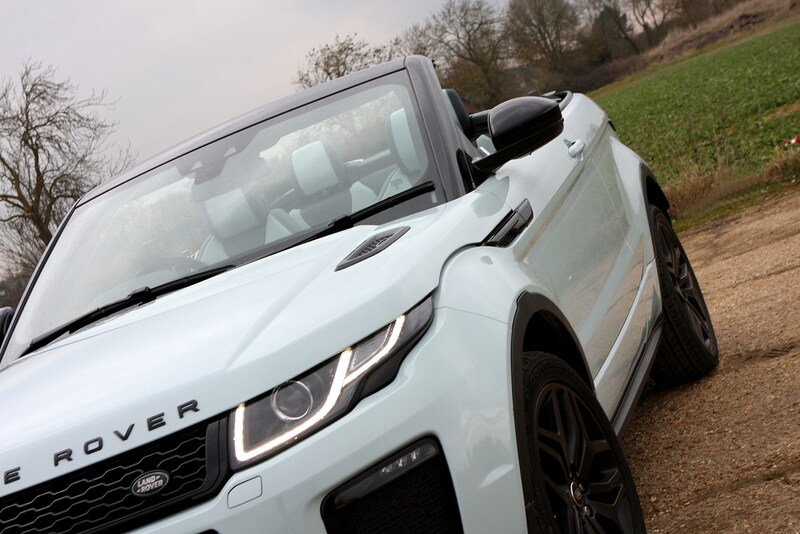 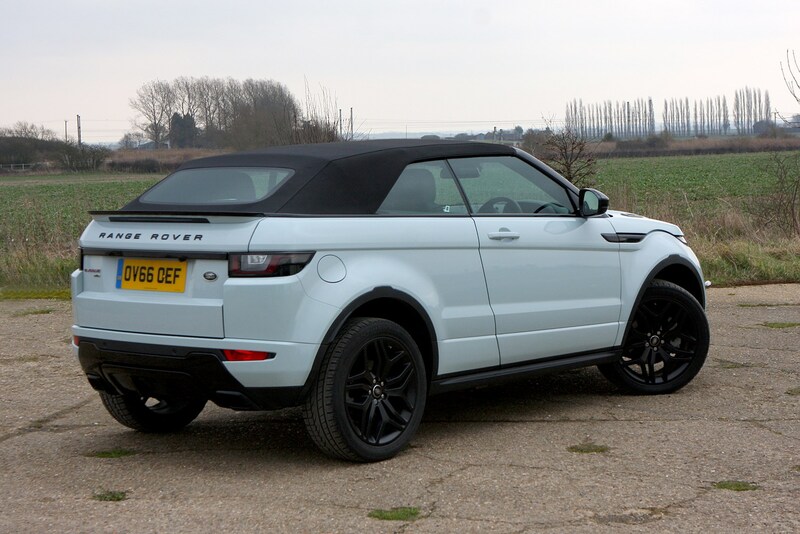 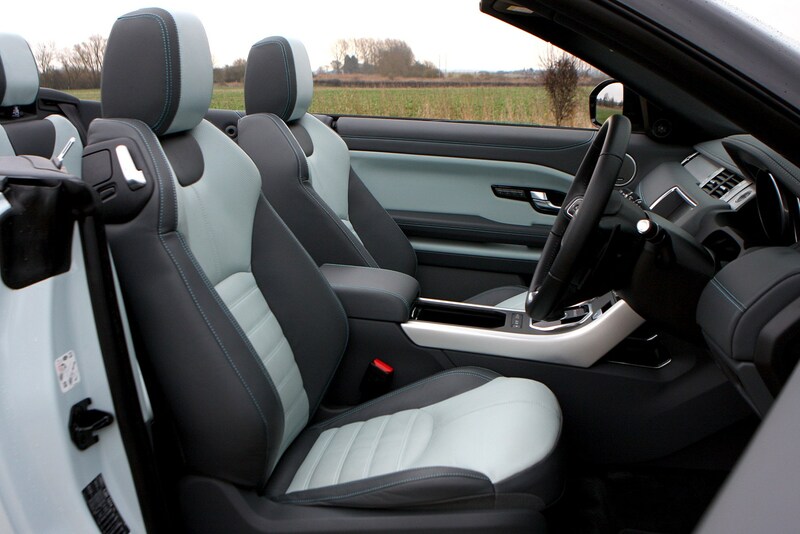 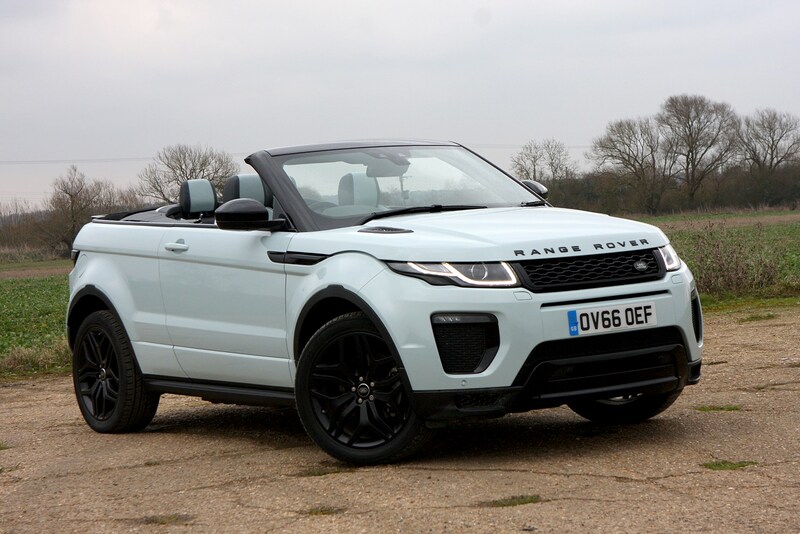 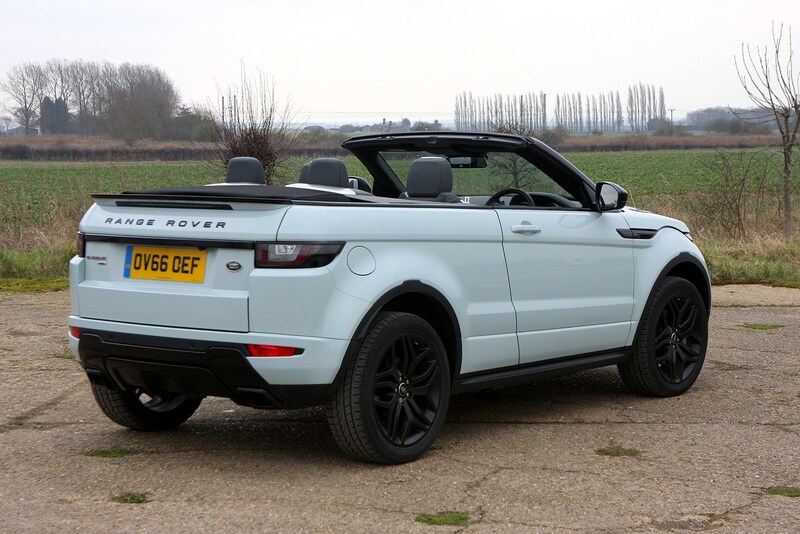 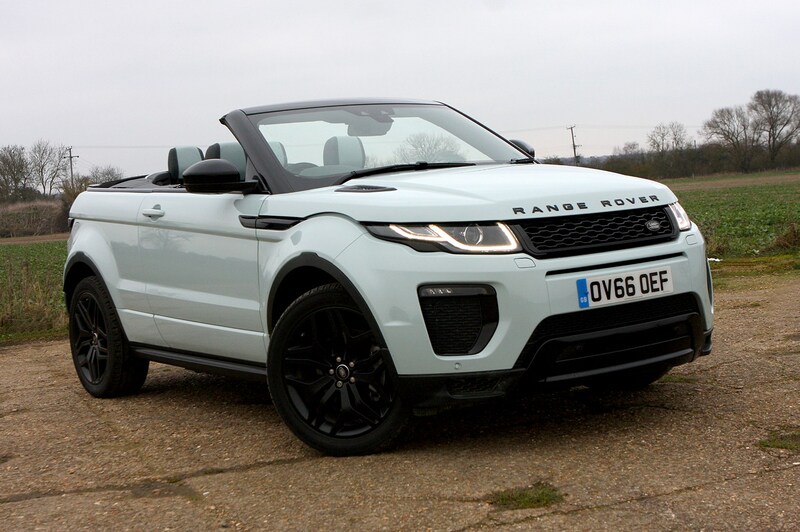 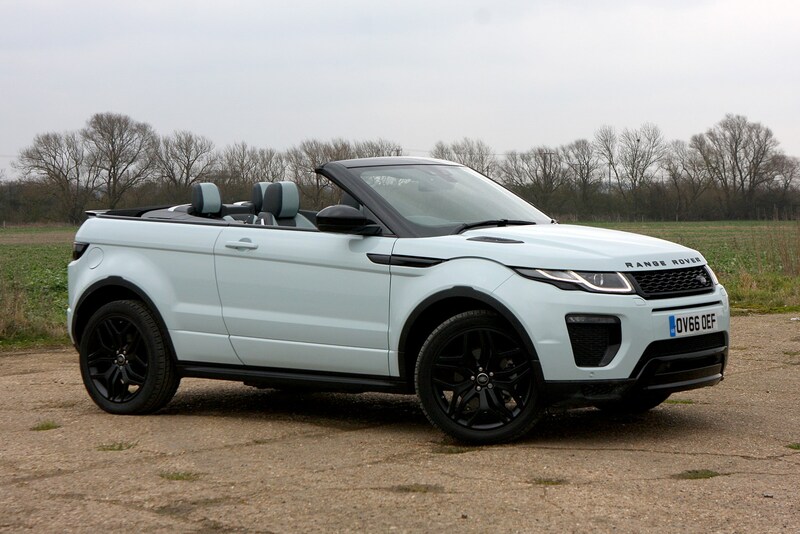 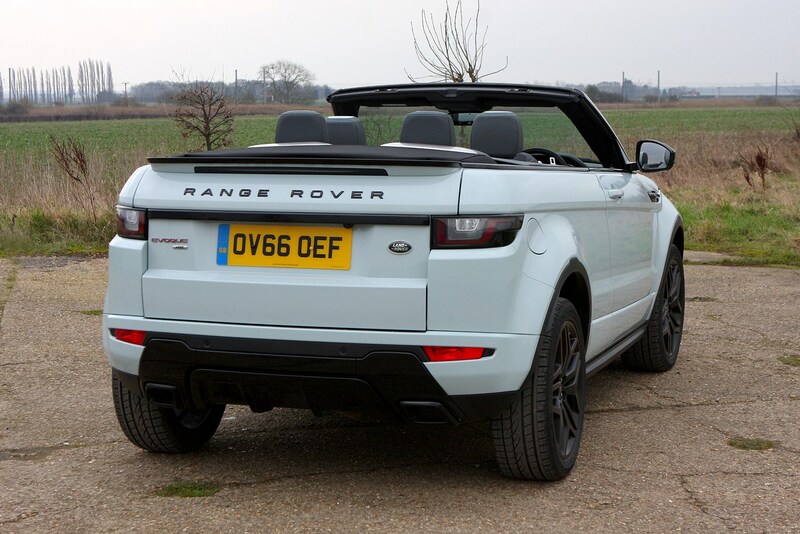 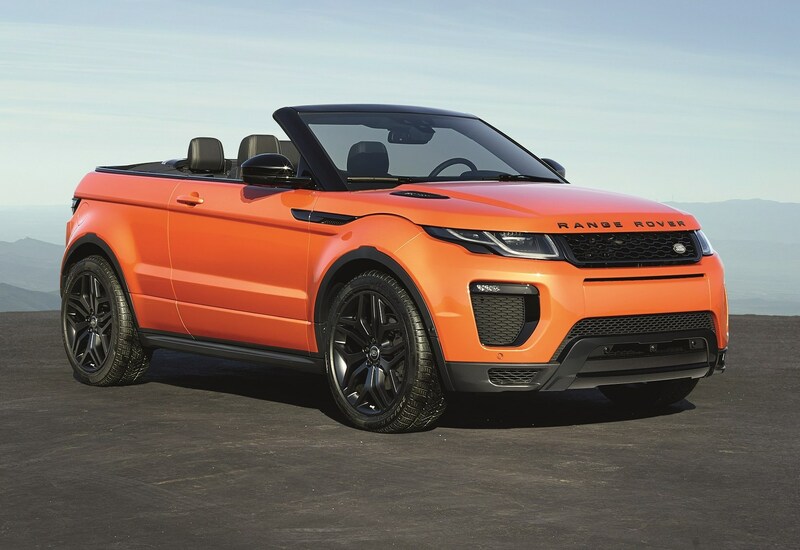 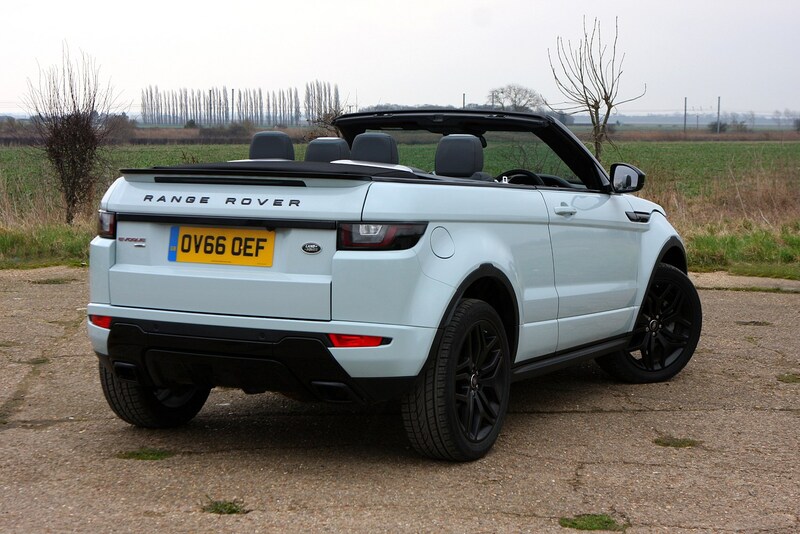 The Evoque Convertible offers niche appeal to many buyers, however a soft-top version of Range Rover’s most popular, most fashionable model is bound to succeed. 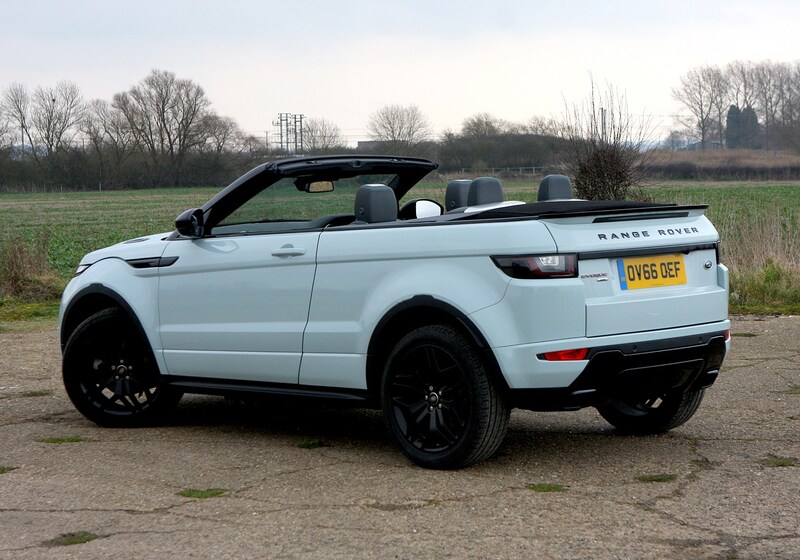 It’s got kerb appeal and an excellent interior, and its ability to properly venture off-road is unique for a luxurious, four-seat drop-top. 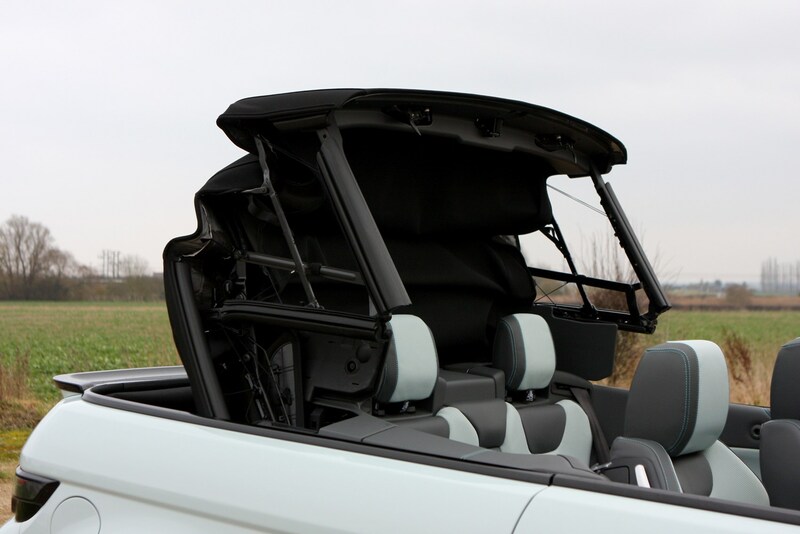 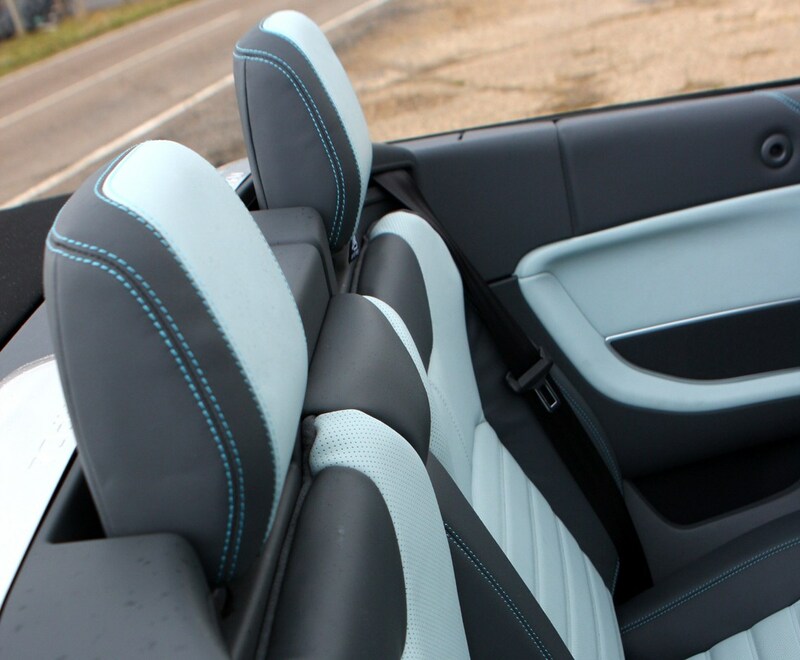 In becoming a Convertible, though, its practicality and driving involvement have taken a hit. 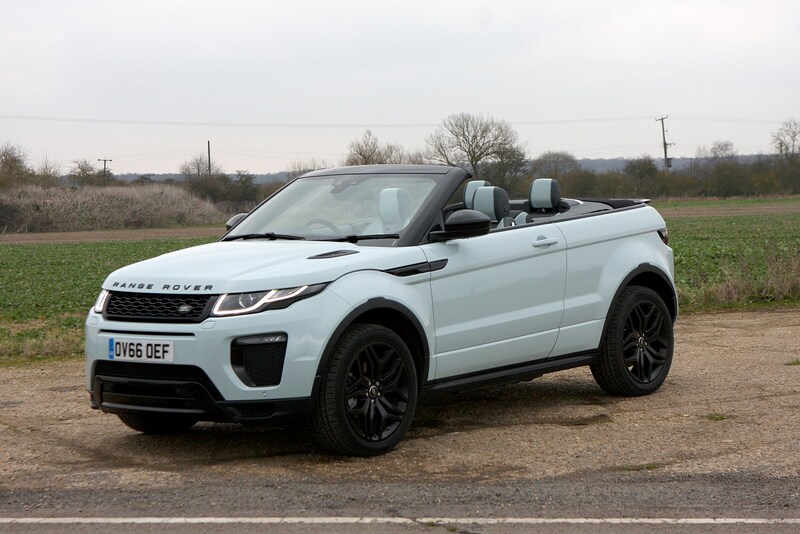 Read the full Land Rover Range Rover Evoque Convertible review to see whether this boutique soft-top remains true to the brand’s core values.